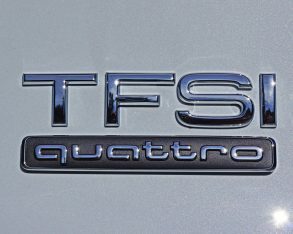 covered that sportier model in 2015 trim, I await a second turn at the wheel with eager anticipation, although another spin in the A3 2.0 TFSI Quattro is certainly a good way to wile away the time. 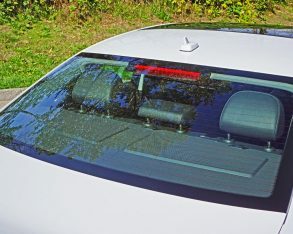 reality it’s just a nice large sunroof shedding light on the front half of the passenger compartment. 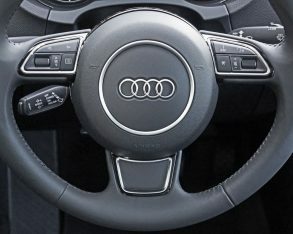 finger gestures (keep your “finger gesture” thoughts to yourself, that’s Audi’s term). 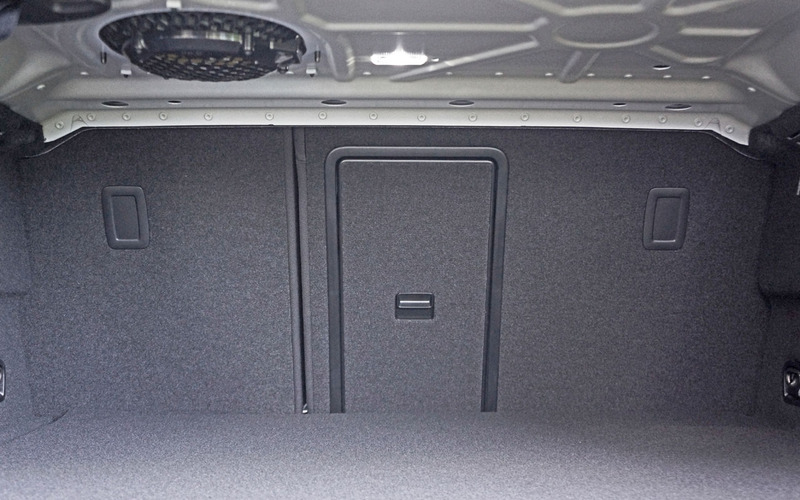 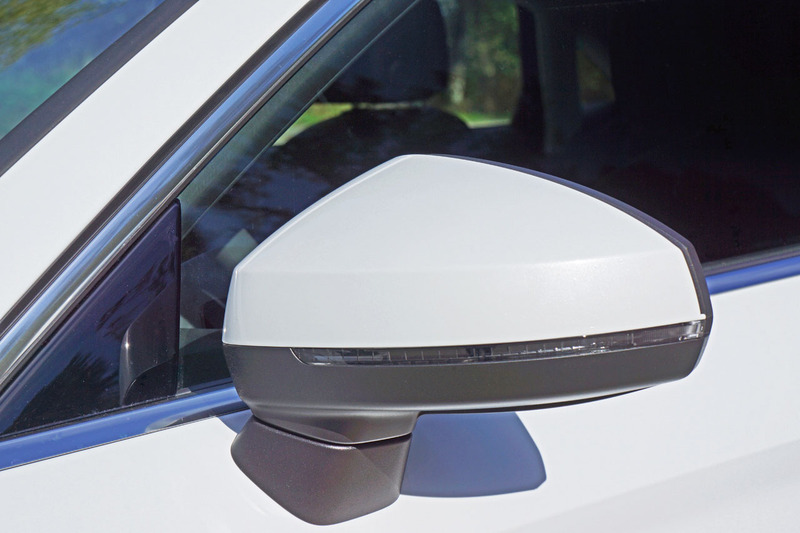 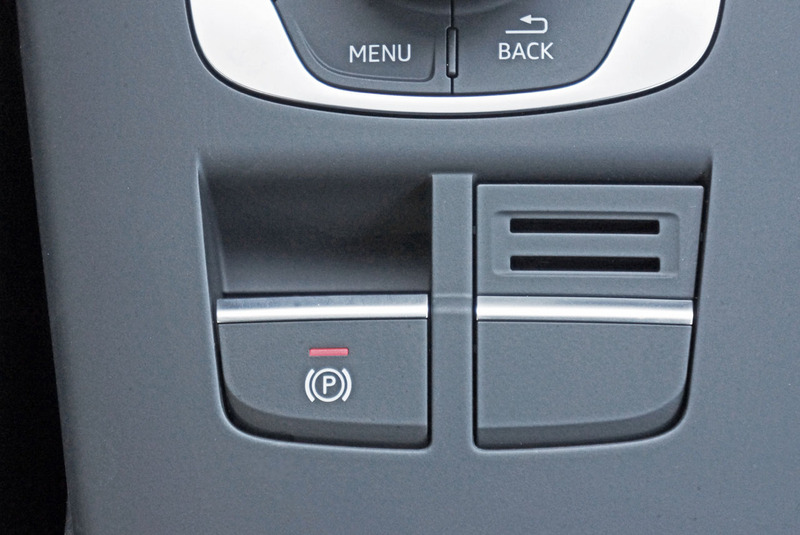 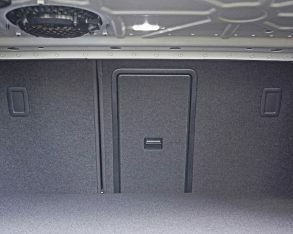 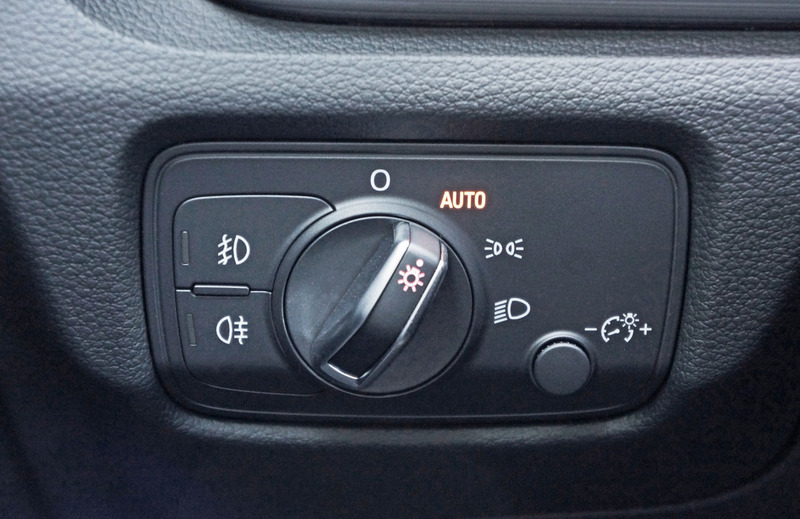 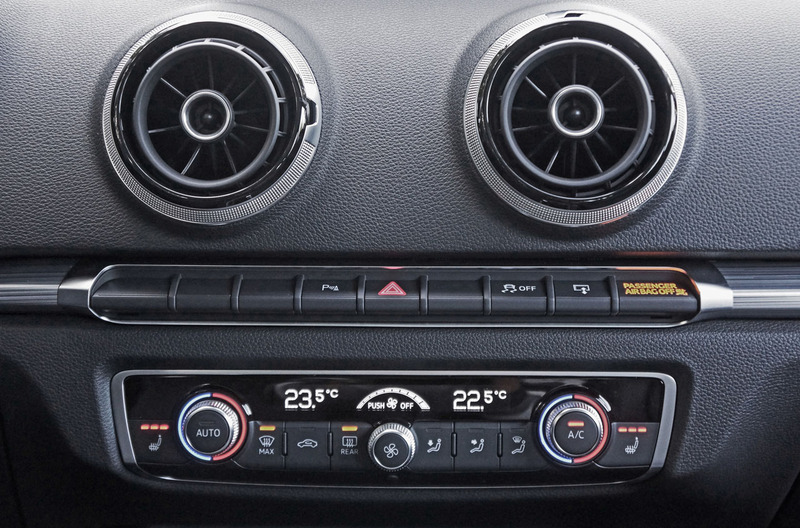 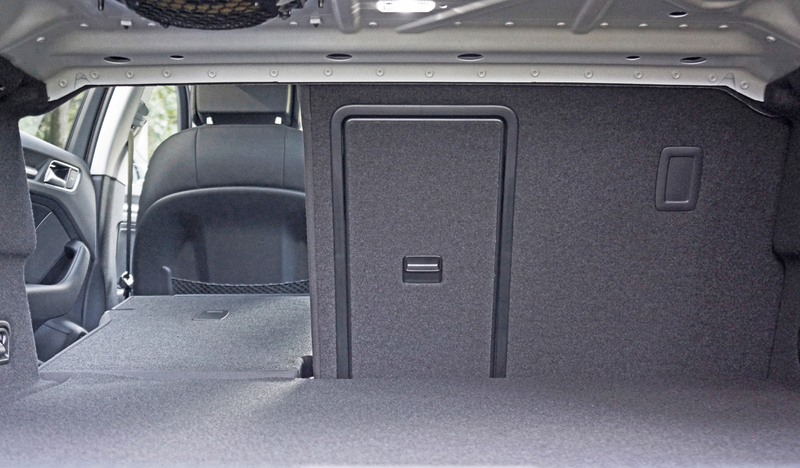 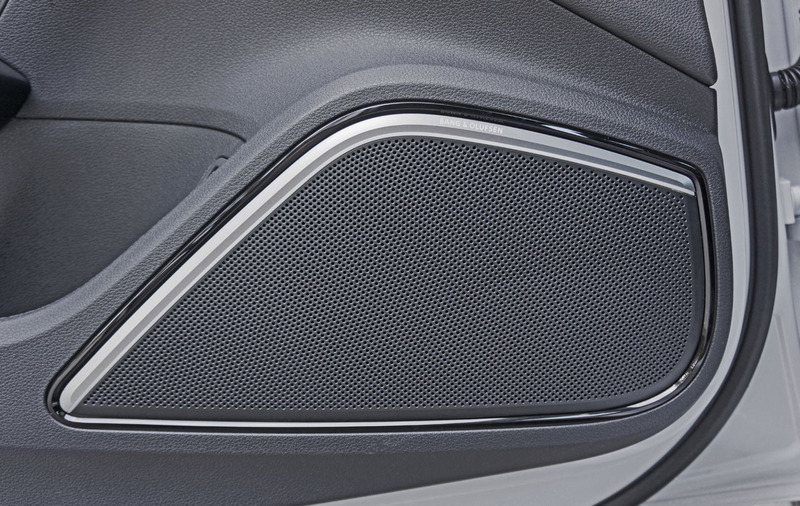 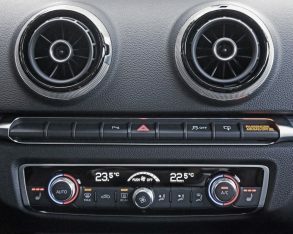 Back up on the stack, a beautifully simple thin strip of ancillary toggles sits just below the two centre vents, while an efficiently packaged dual-zone auto HVAC panel is housed underneath. 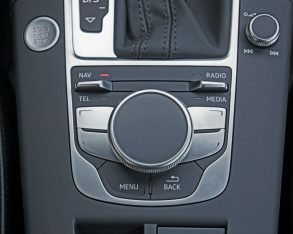 Down on the lower console again, the layout of the gear selector, ignition button, audio volume dial, and the aforementioned MMI infotainment control panel is eye candy to design devotees and relief to those who suffer from OCD, the entire interior as well laid out and efficiently packaged as this class gets. 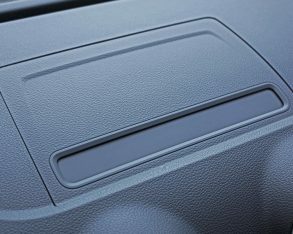 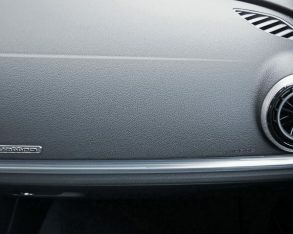 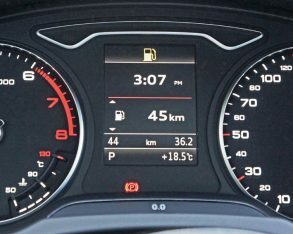 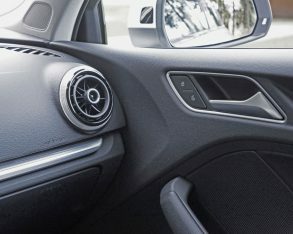 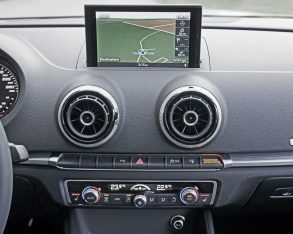 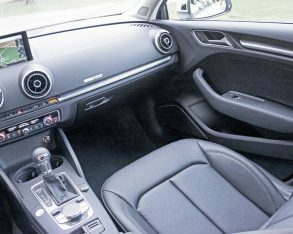 badged cars exude, the A3’s dash top gets a higher grade of soft-touch synthetic than you’ll find in the majority of mainstream volume branded compacts, at least those that actually include pliable plastics, while this treatment extends down to the halfway point of the instrument panel, as well as over to the front and rear door uppers, also ending about halfway down the doors where harder plastics take over. 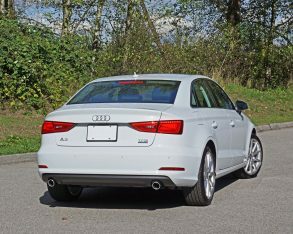 This is par for the course amongst compact premium players, extended soft-touch not available until moving up into larger, pricier models. 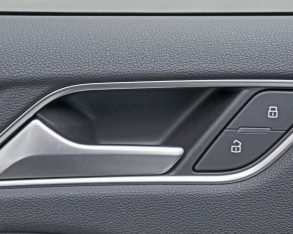 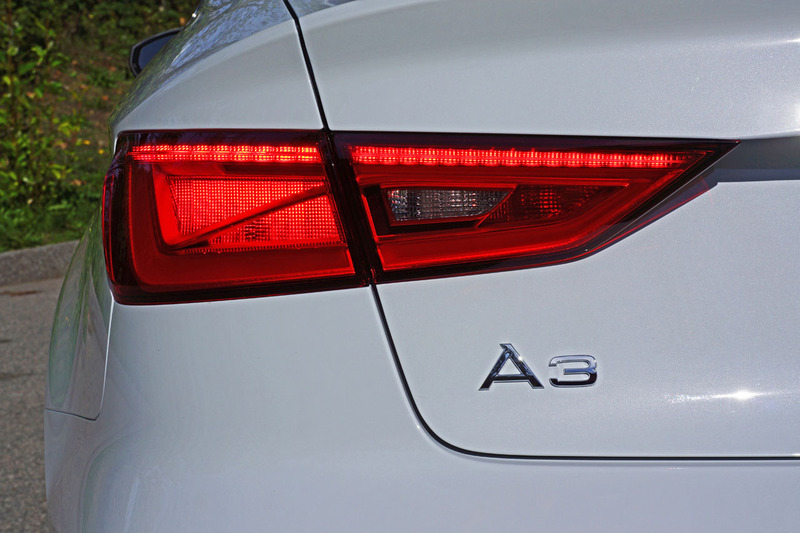 The A3’s materials quality plus fit and finish worked well for me, and I’m a stickler when it comes to such issues, while the switchgear was mostly tight, evenly spaced and well damped, again exuding that quality feel. 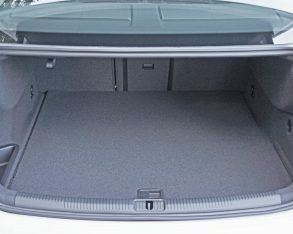 large for my five-foot-eight frame. 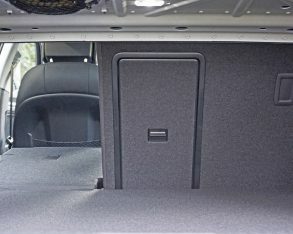 Granted I’m not a hulk of a man, nor is my 95-pound, five-foot-even partner an Amazon woman, but there was still much more room than we could use. 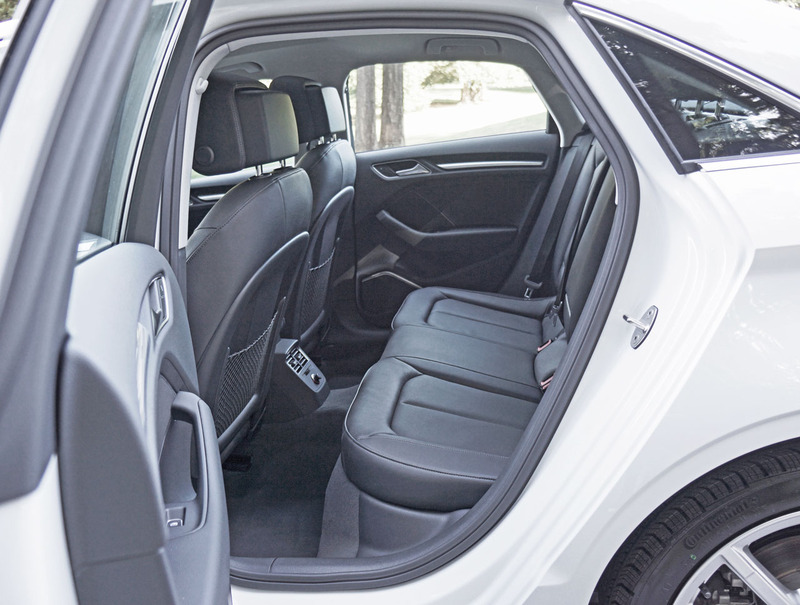 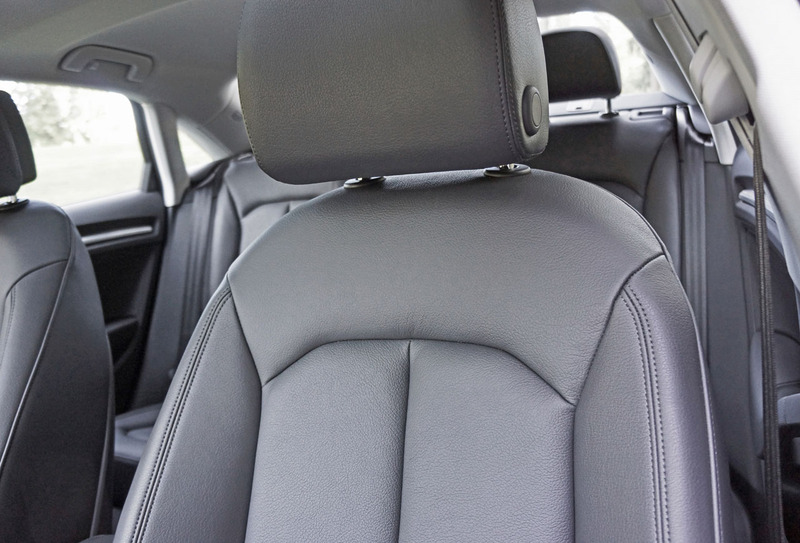 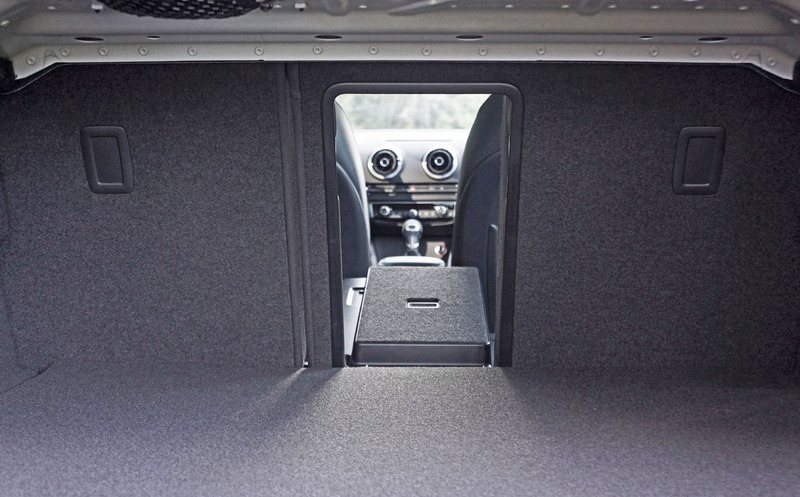 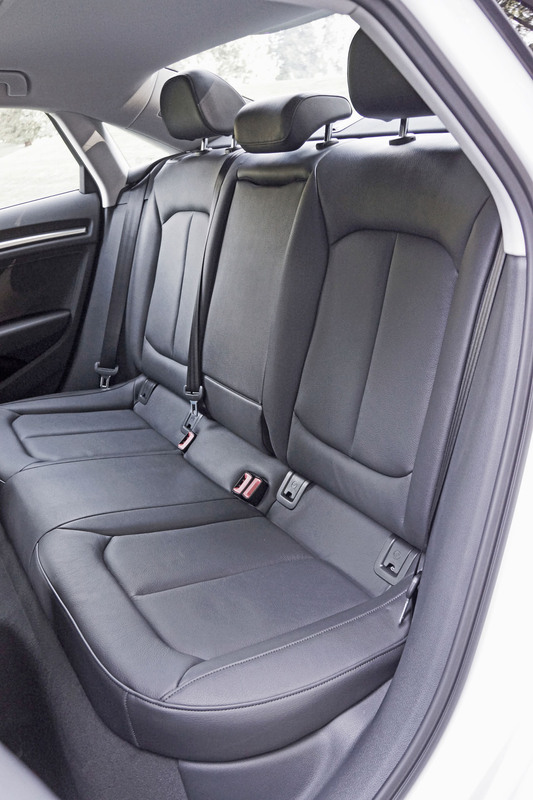 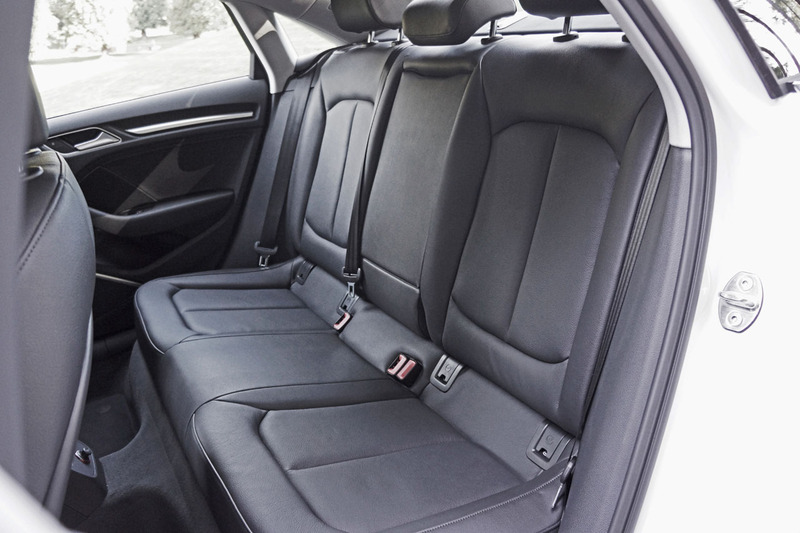 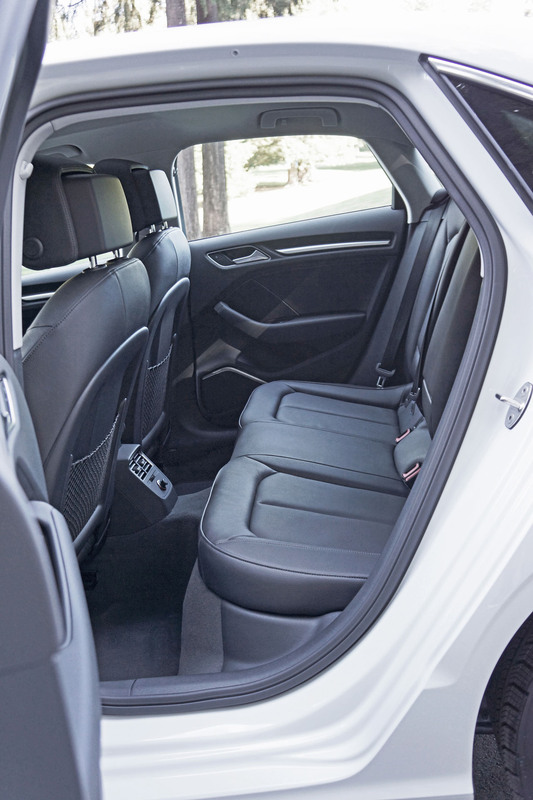 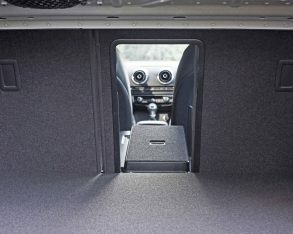 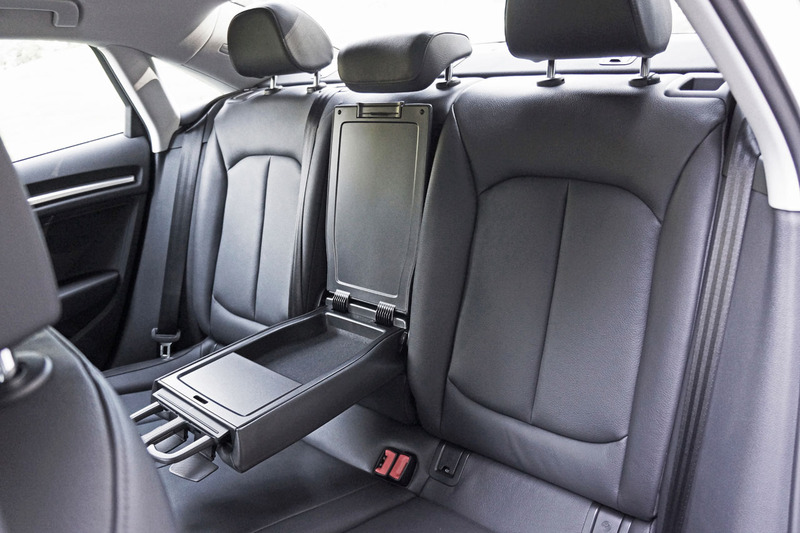 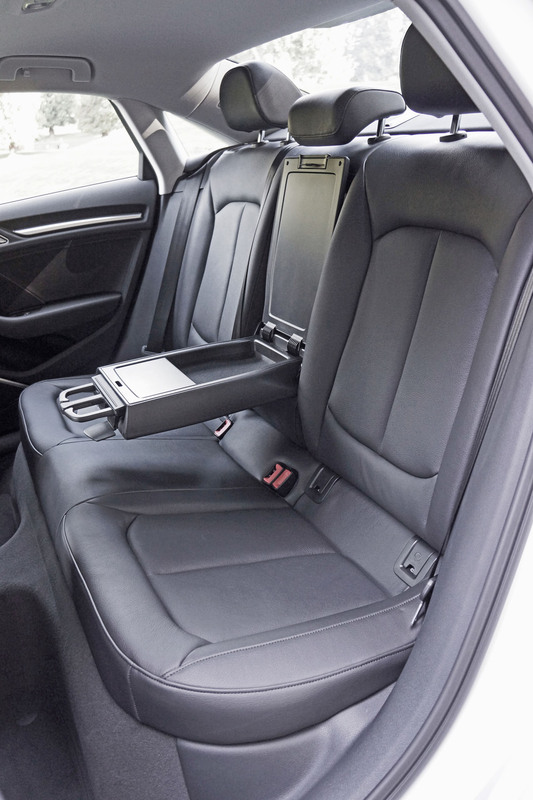 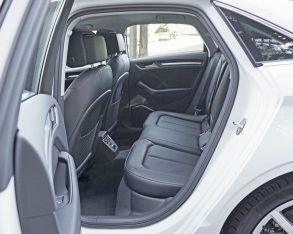 It’s only when venturing into the rear seating area that larger folks might feel a bit cramped, as there was a mere inch above my head when sitting in back, albeit plenty of legroom. 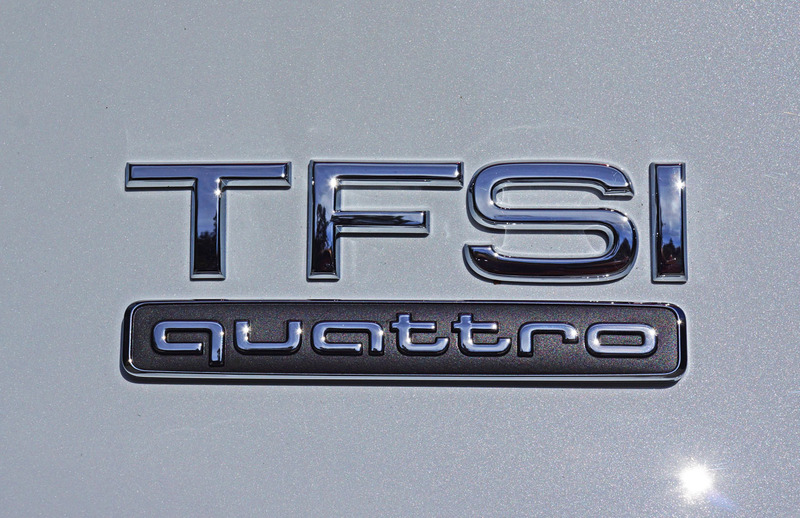 trip for four to your favourite slope, with the added confidence of Quattro to get you there safely. 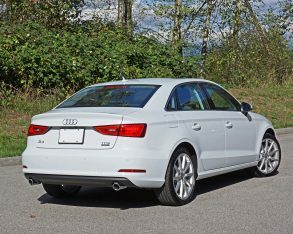 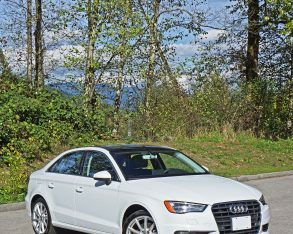 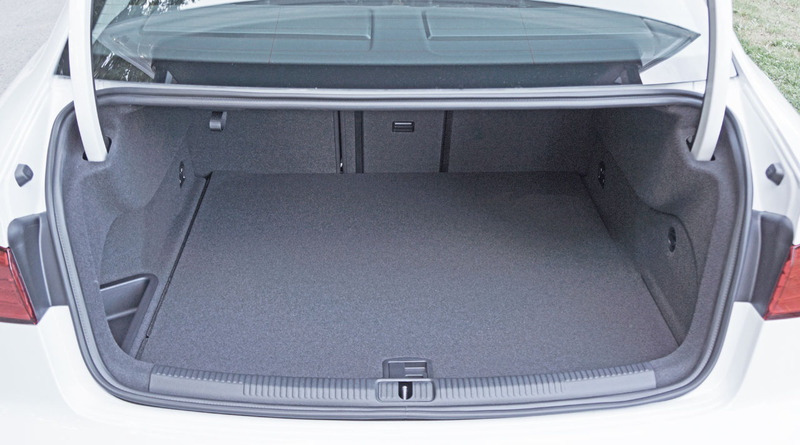 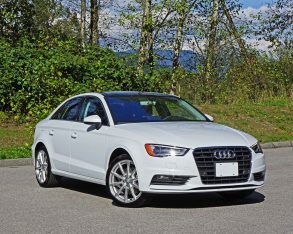 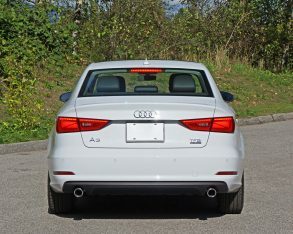 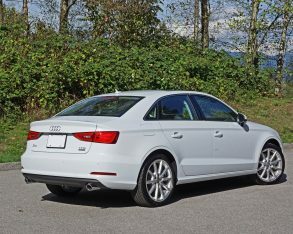 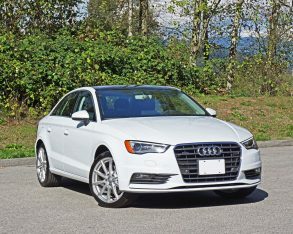 Up until recently you could get an A3 Sportback version with up to 480 litres (16.9 cubic feet) of gear toting capacity behind its rear seats and even more than the sedan when tumbled down, but it was only available in “clean diesel” here in Canada, so for the time being, for reasons you are likely very aware, its unavailable. 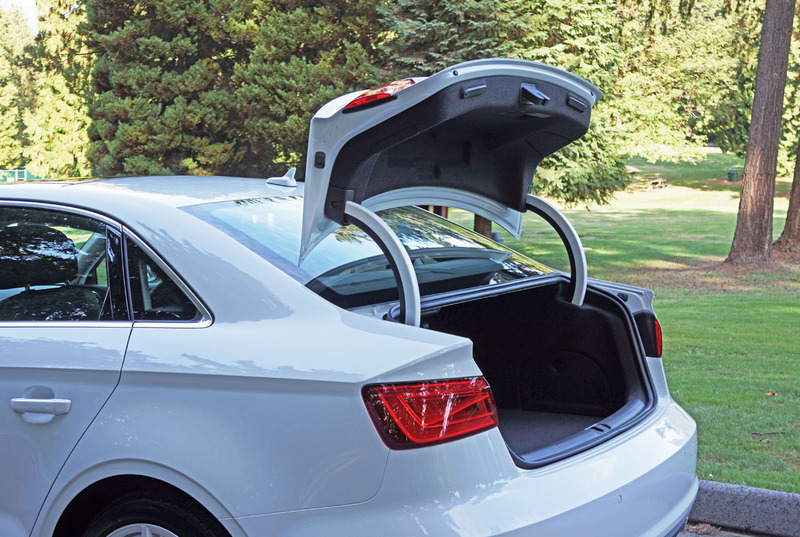 It didn’t include Quattro anyway, so it wasn’t the best all-season family hauler. 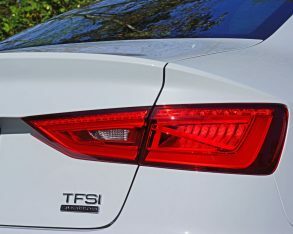 impressive numbers for the car’s 1,440-kilo (3,174-lb) curb weight, with 170 horsepower and 199 lb-ft of torque allowing for a 7.7-second sprint to 100 km/h and a tire-regulated top speed of 209 km/h (130 mph), while my as-tested 2.0-litre TFSI is even more energetic thanks to 220 horsepower and a sizable 258 lb-ft of torque, good for a 6.3-second charge to 100 km/h and an identical terminal velocity. 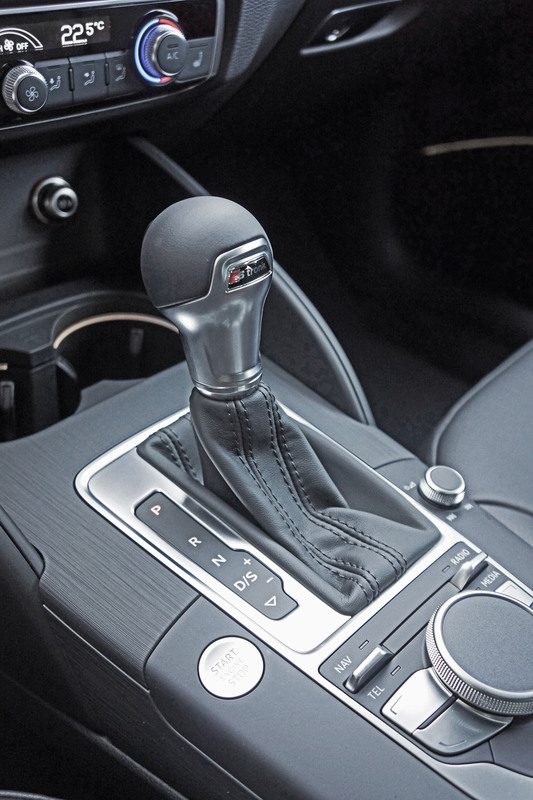 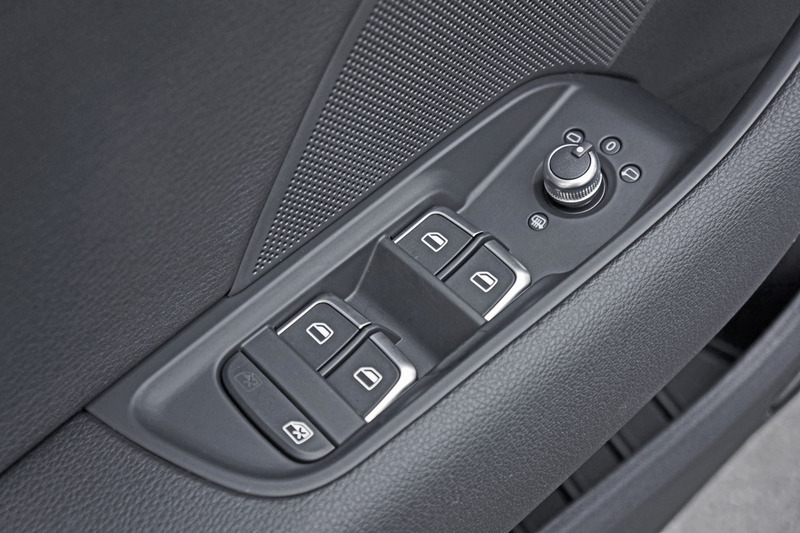 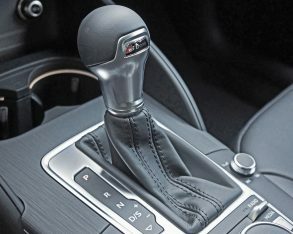 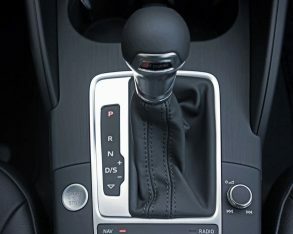 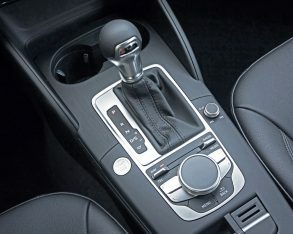 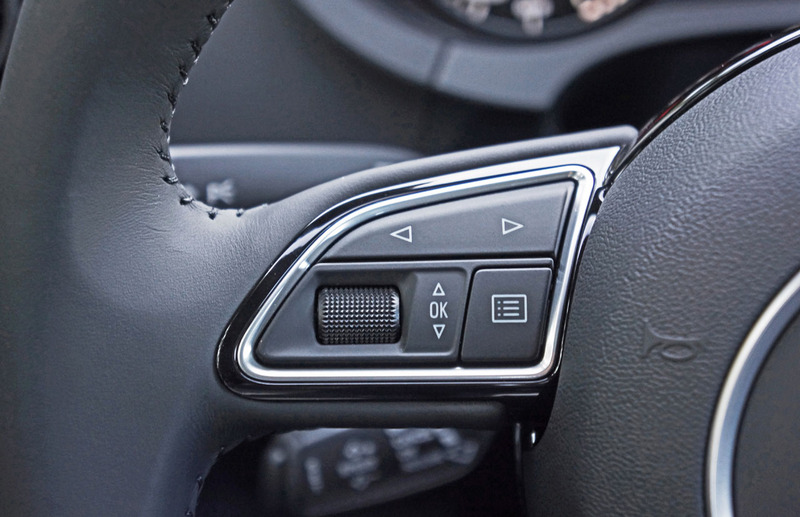 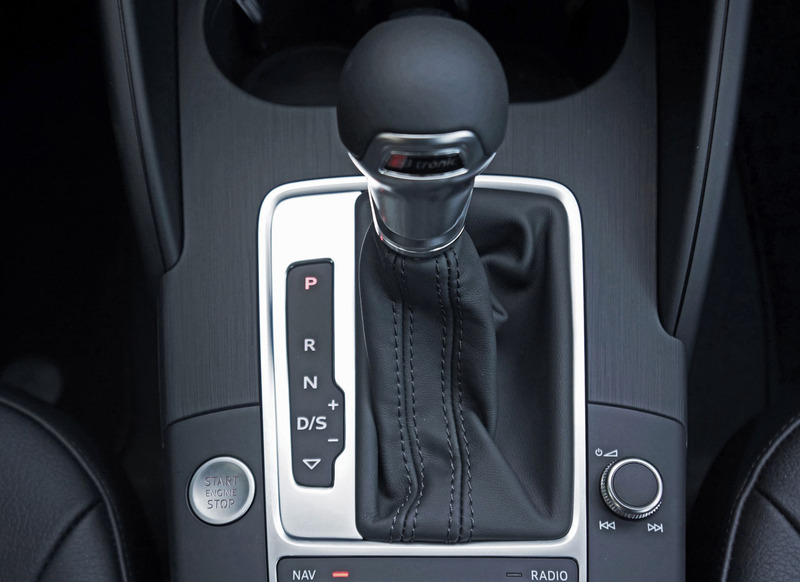 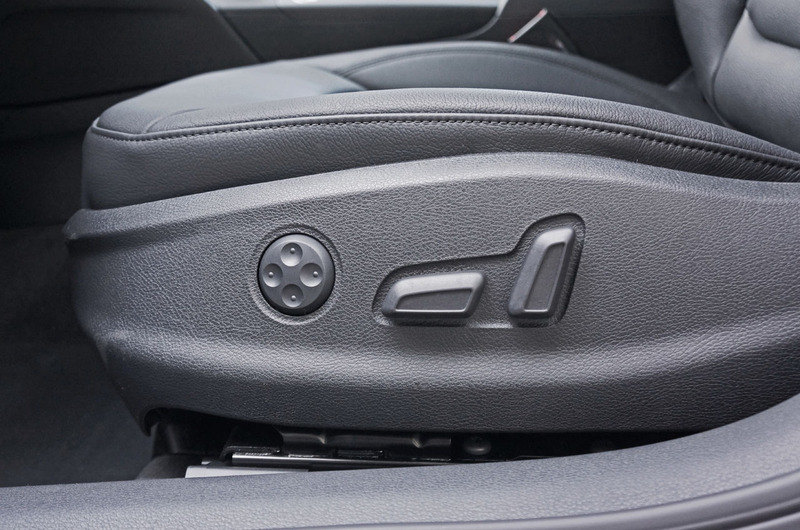 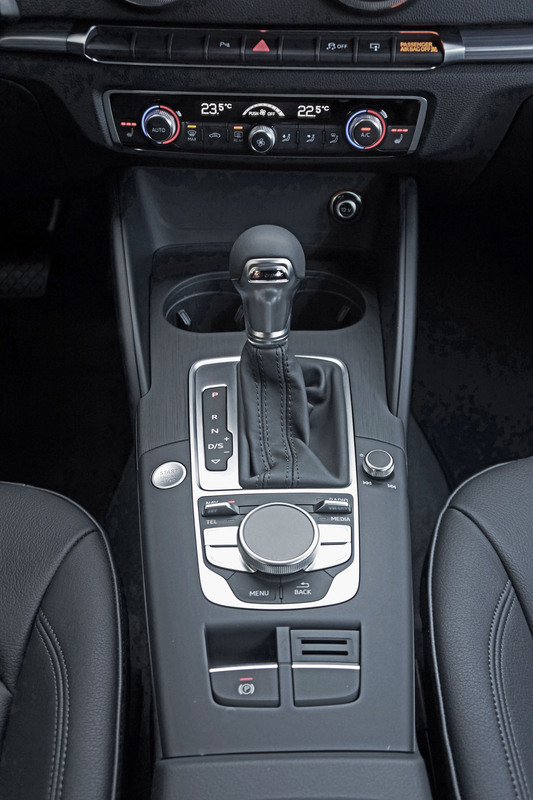 Both engines benefit from direct-injection and turbocharging, while a six-speed dual-clutch automated S tronic gearbox featuring manual-mode at the shift lever comes standard. 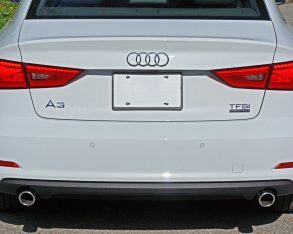 a car for those who really enjoy driving, although maybe I should reword what I just said, because if you currently don’t enjoy driving you should probably test out an A3 to see if it’s the process of hitting the road that leaves you flat or the vehicle you’re strapped into. 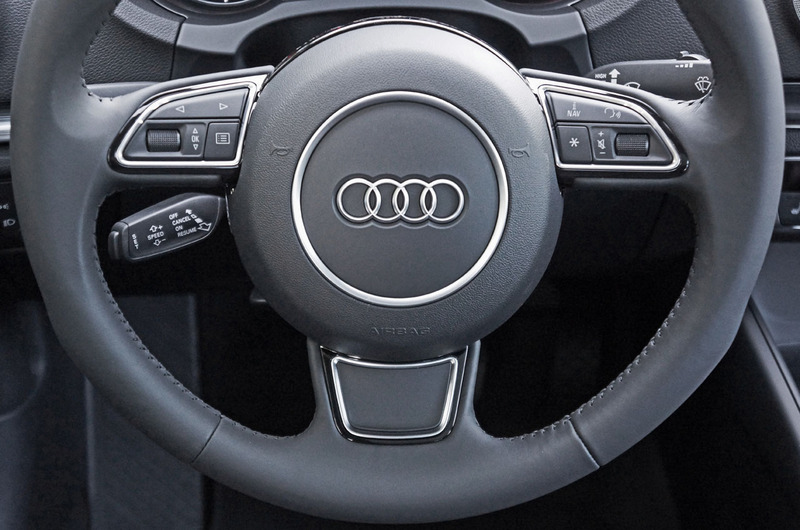 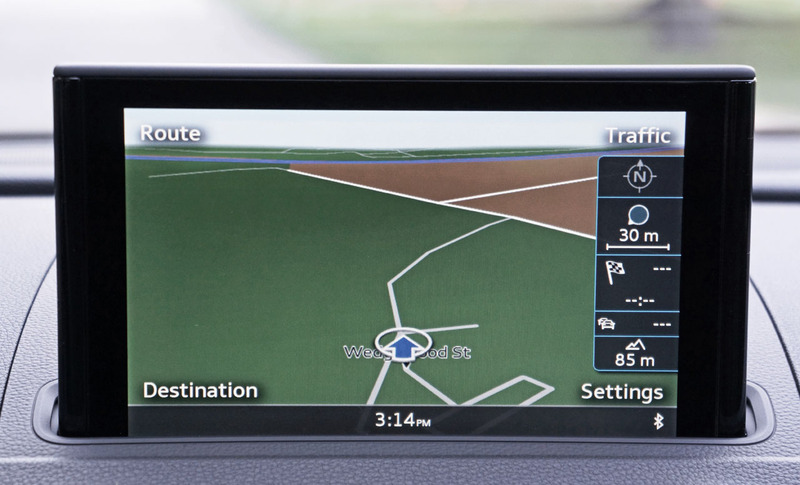 at the wheel of an A8 TDI), let alone roads that intertwine through Germany’s own Black Forest. 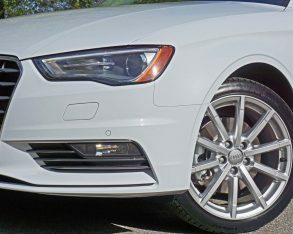 I took opportunity to test the A3 Quattro’s handling mettle right here at home, and found it especially capable through high-speed fast-paced corners, its low mass and well sorted chassis ideal for slaloming through S-turns, diving deep down into sharply undulating verticals no matter the clip, with nice, crisp response to steering input and superb braking with very little fade after repeated stomps. 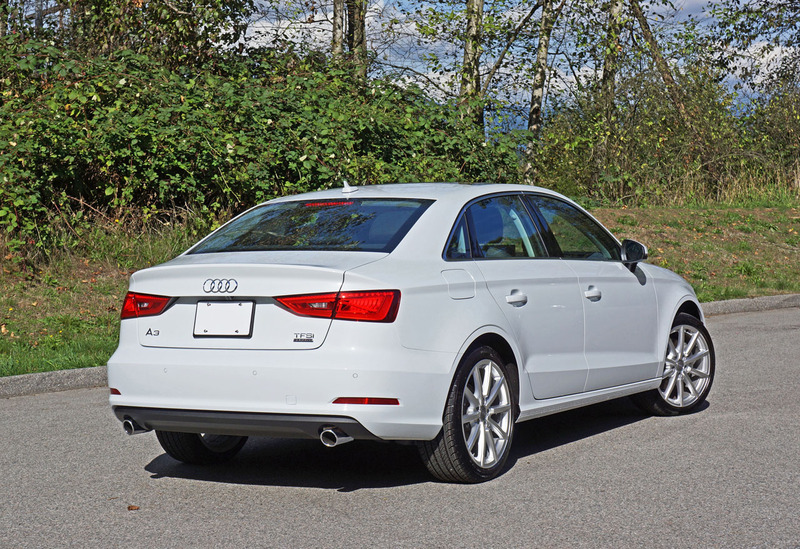 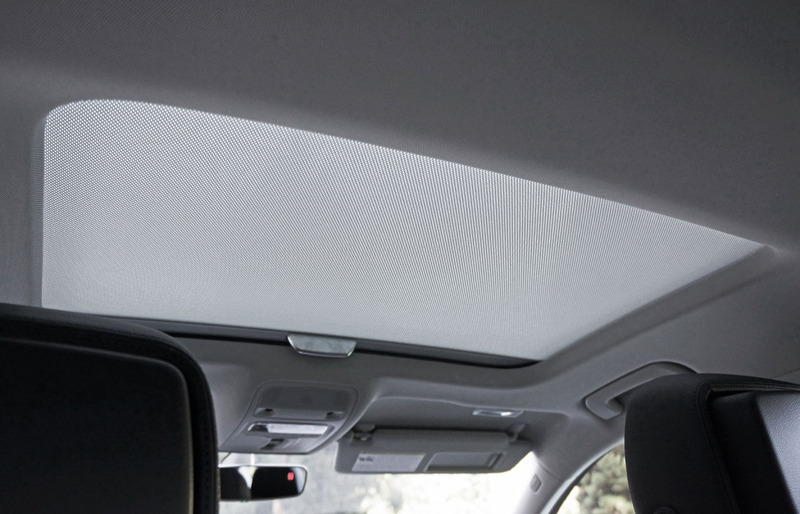 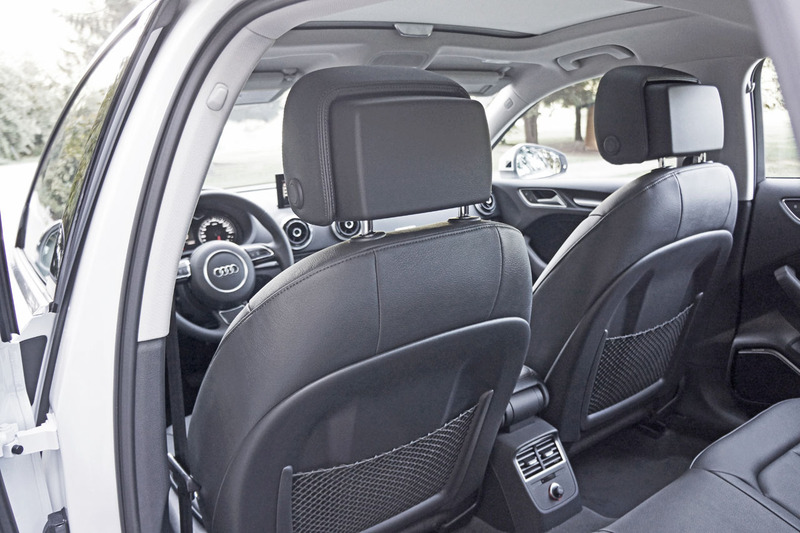 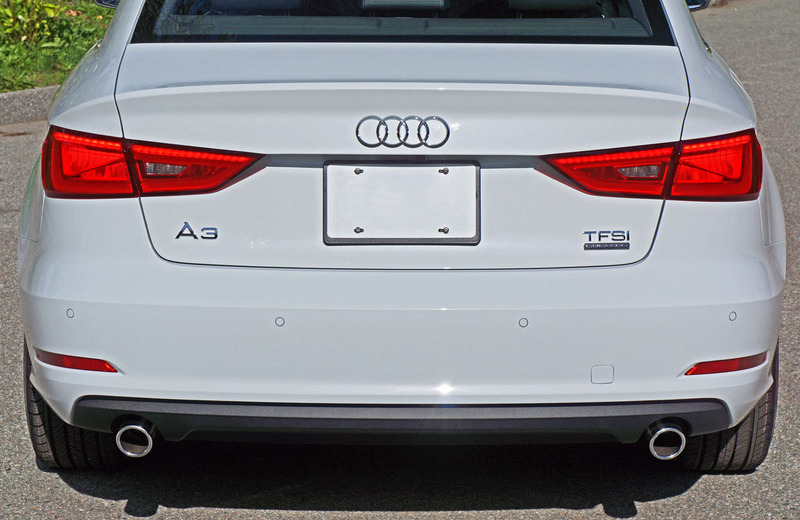 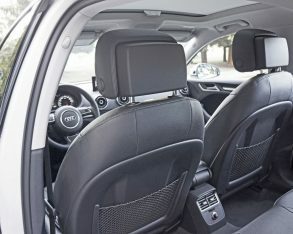 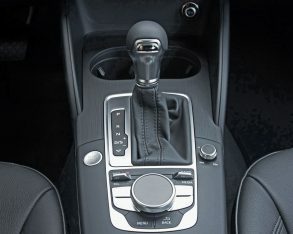 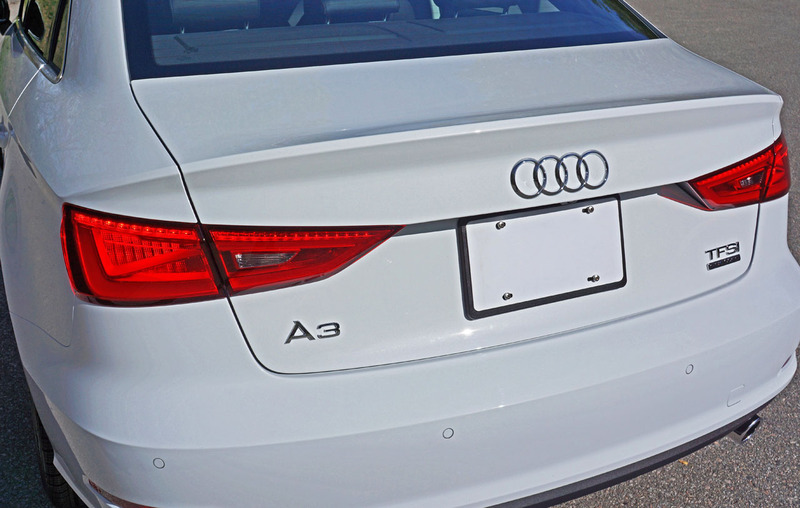 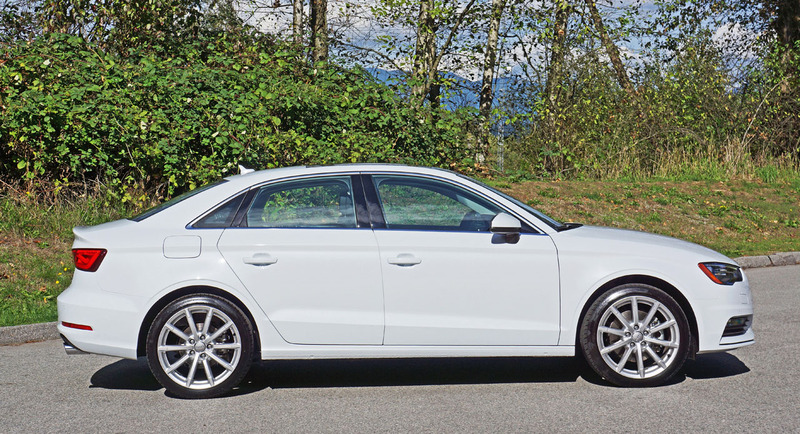 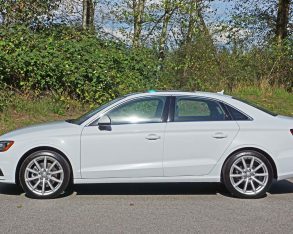 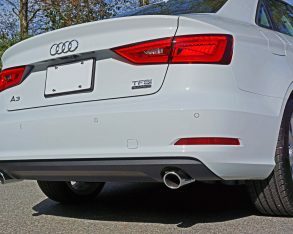 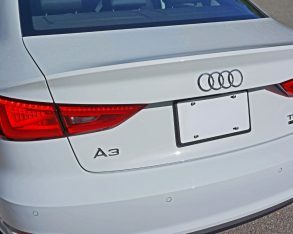 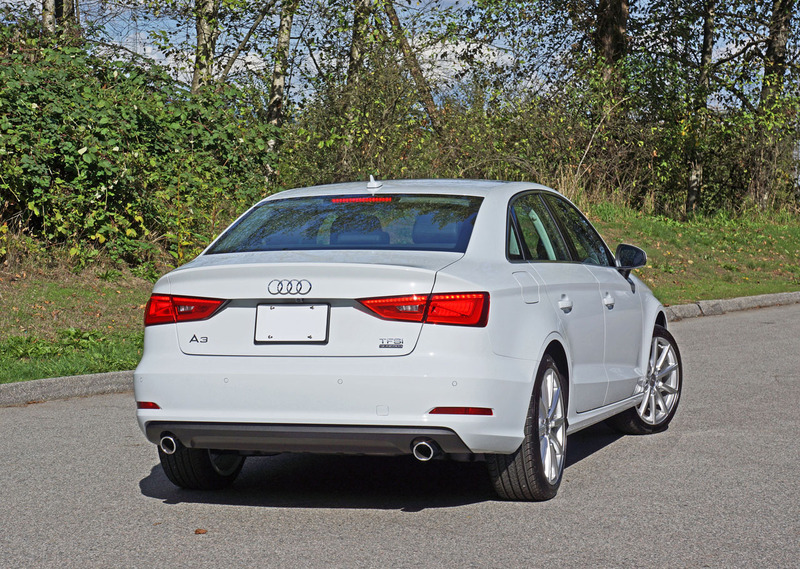 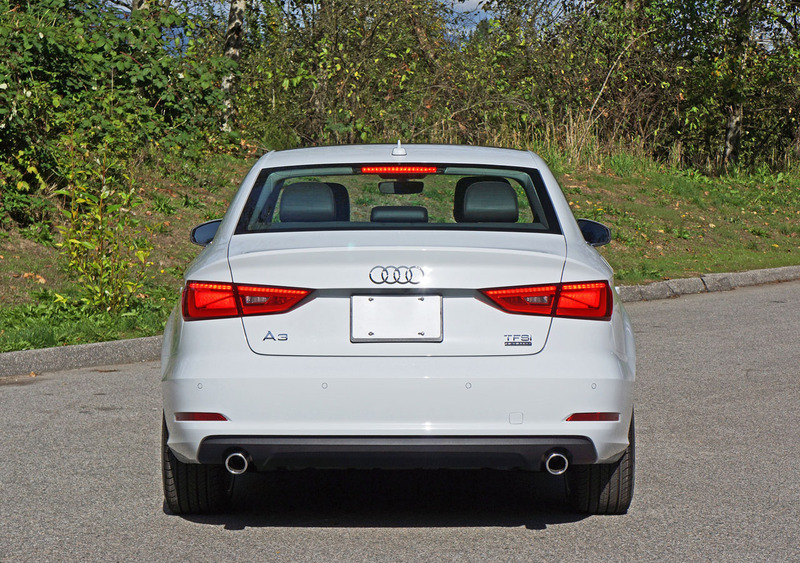 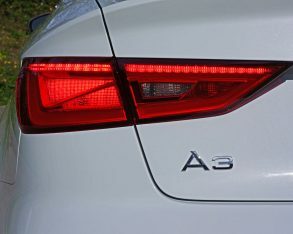 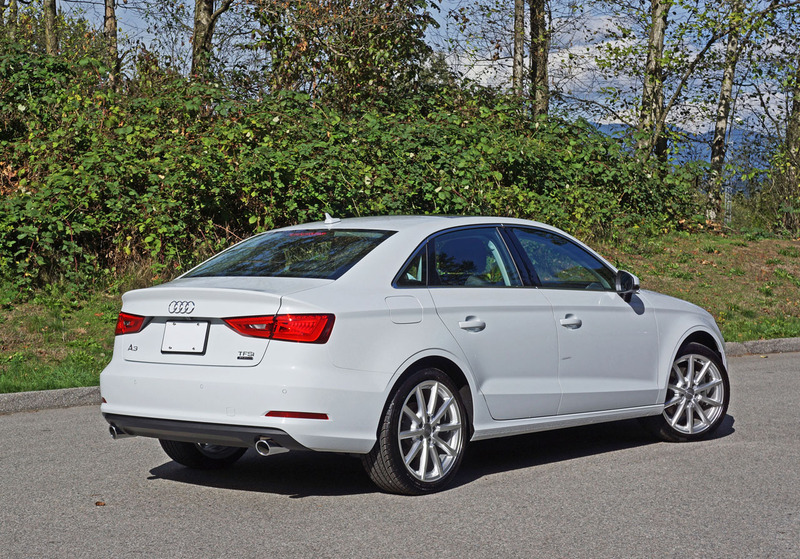 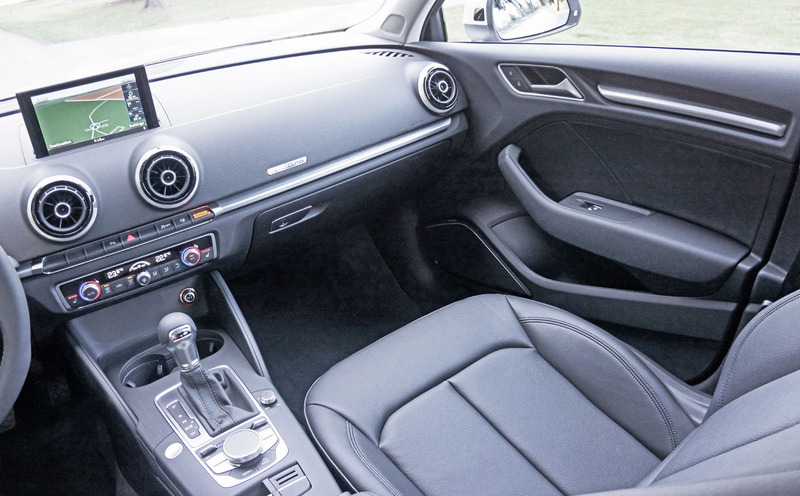 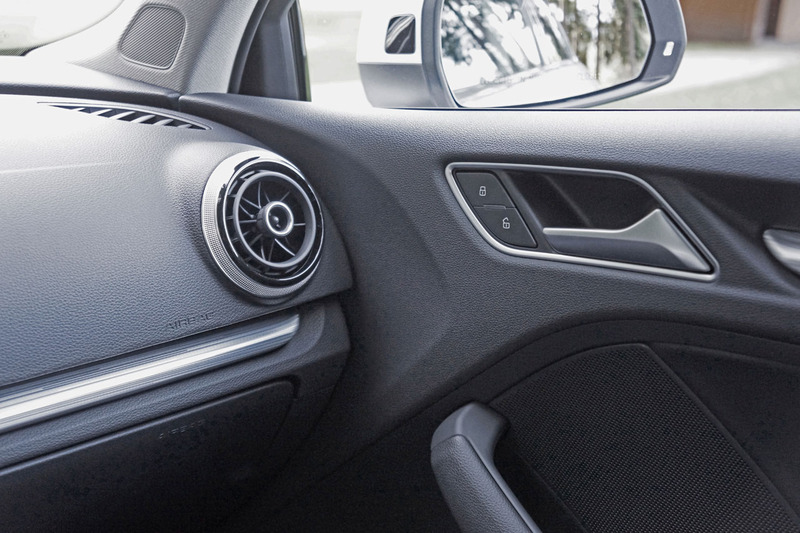 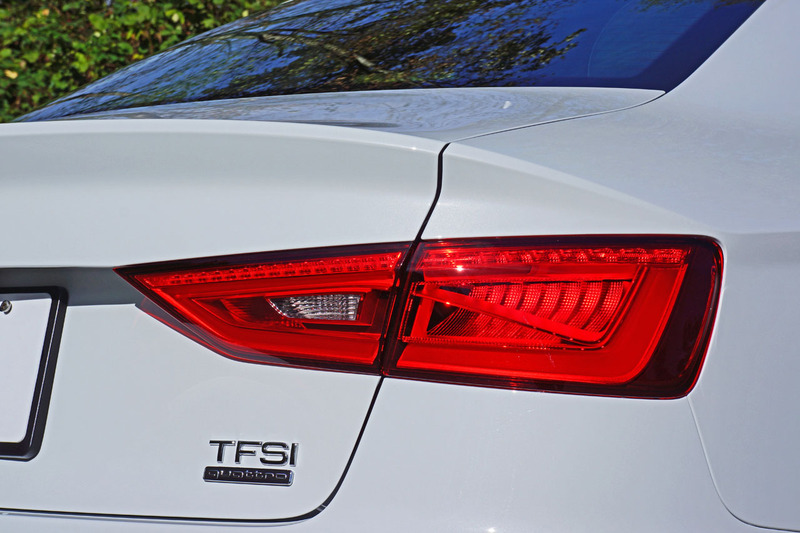 The A3 is a thoroughly engaging car no matter the situation, the type of vehicle that gives its driver total confidence. 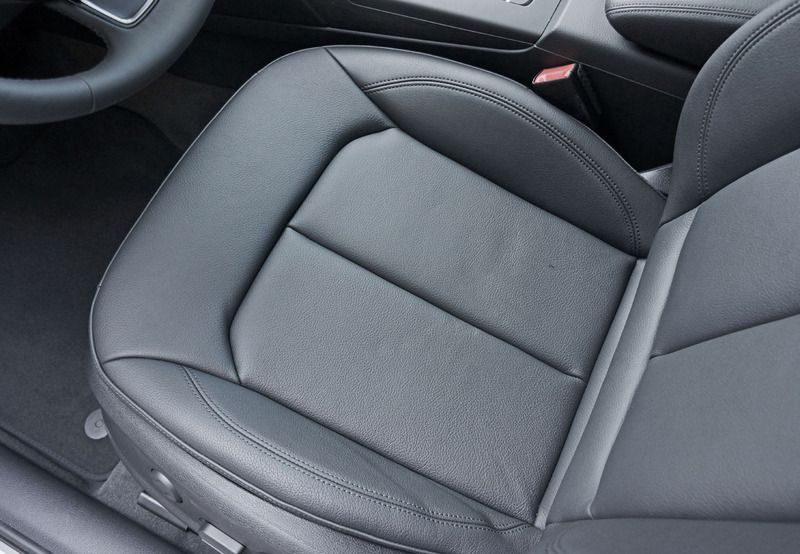 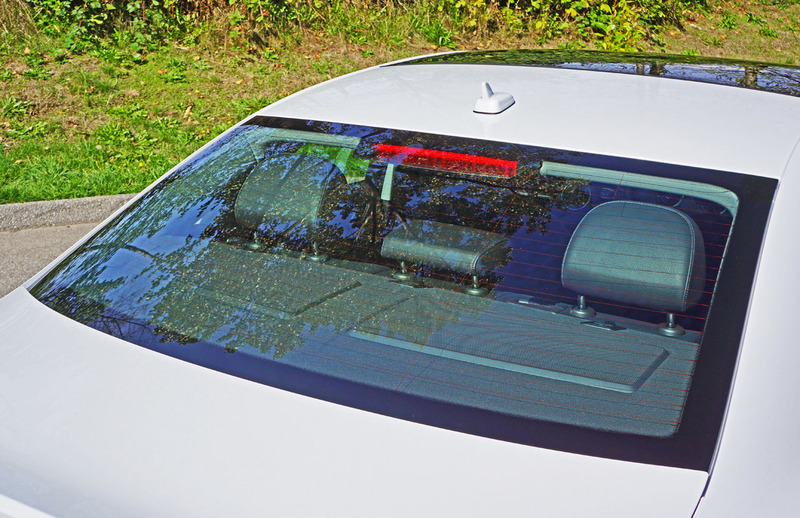 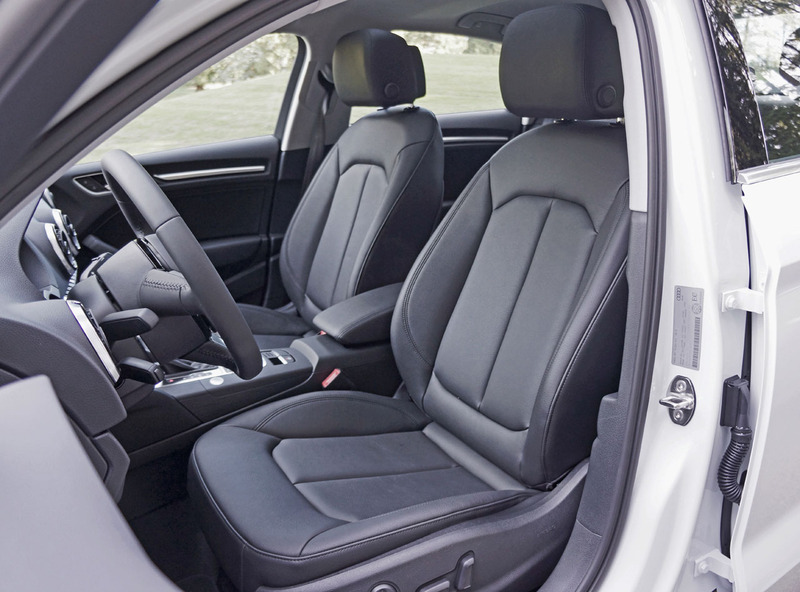 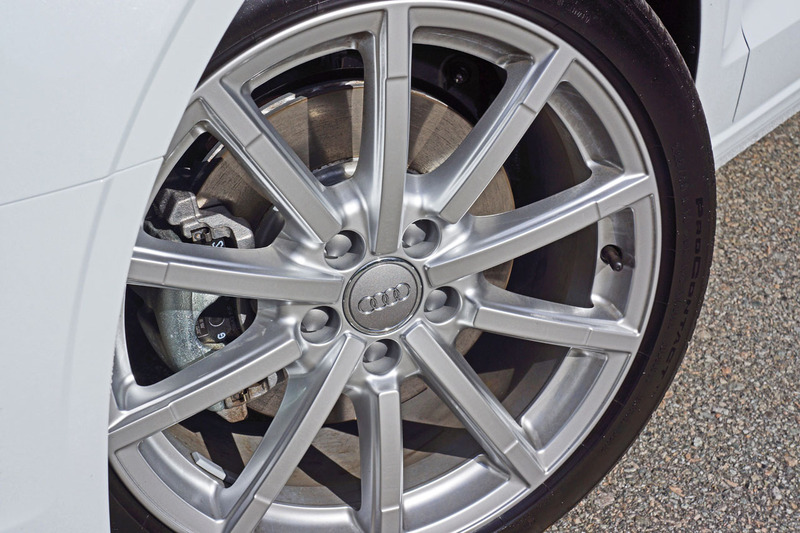 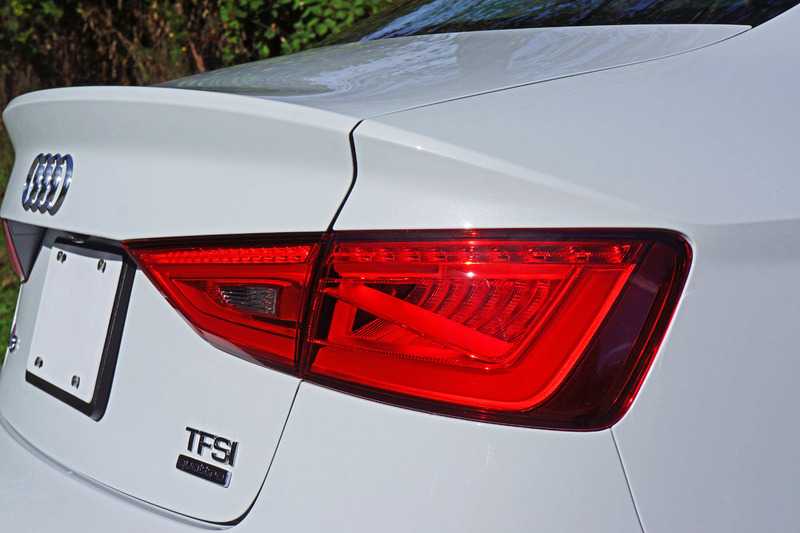 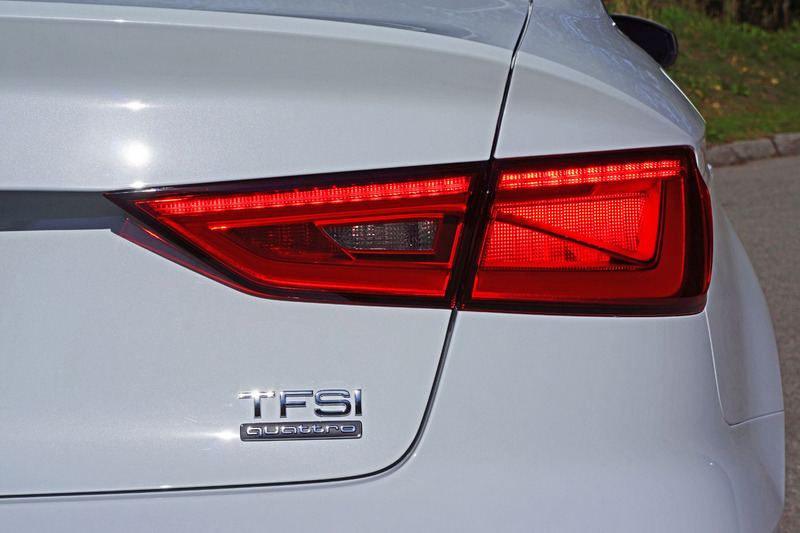 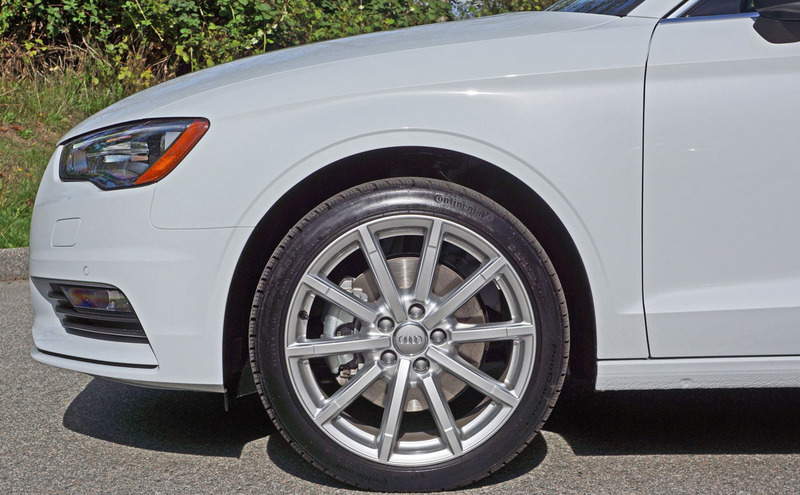 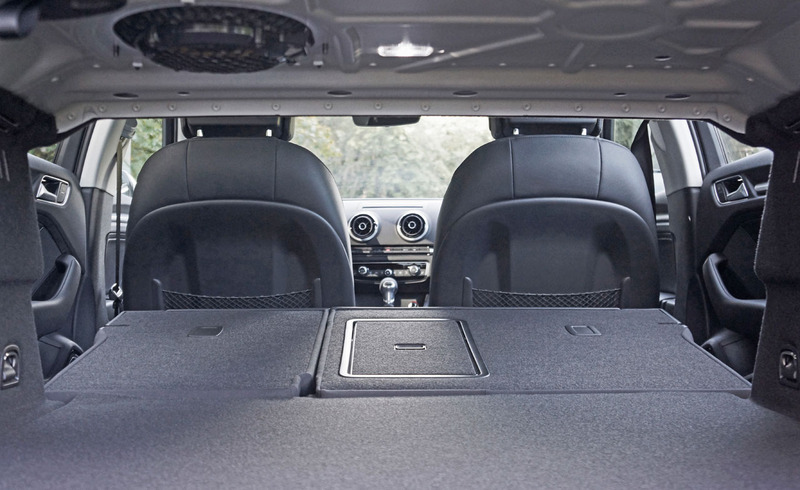 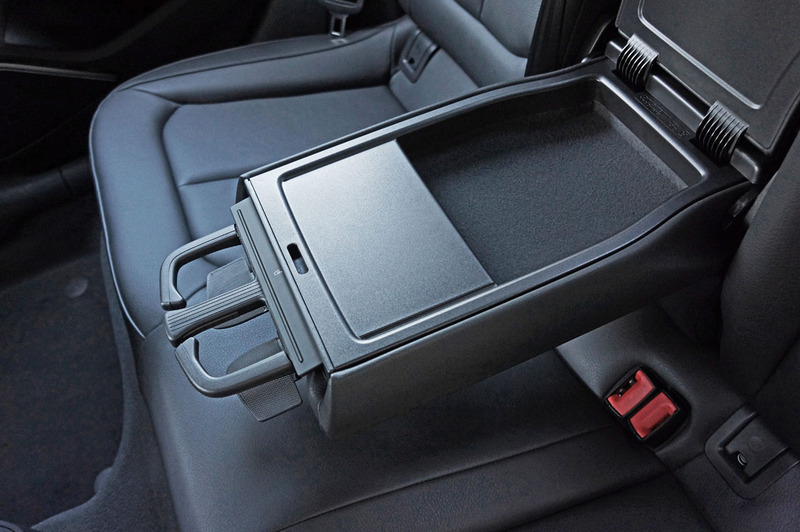 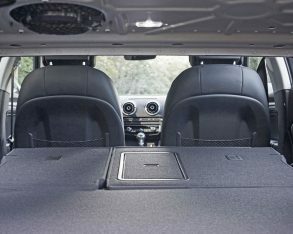 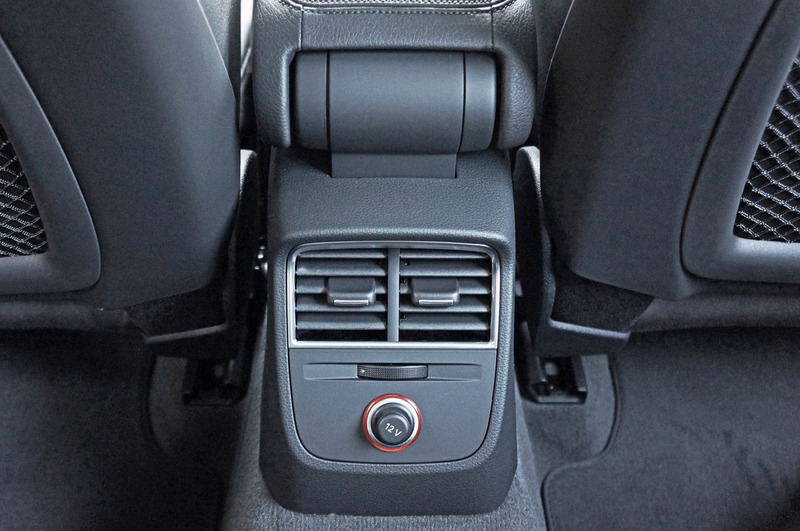 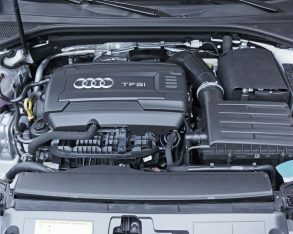 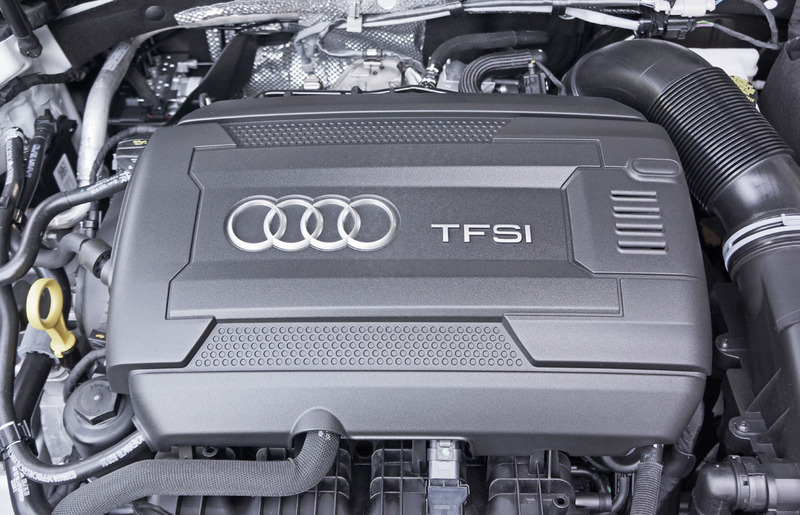 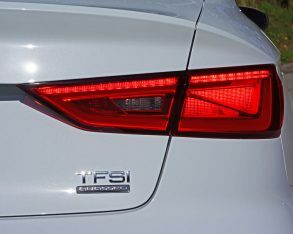 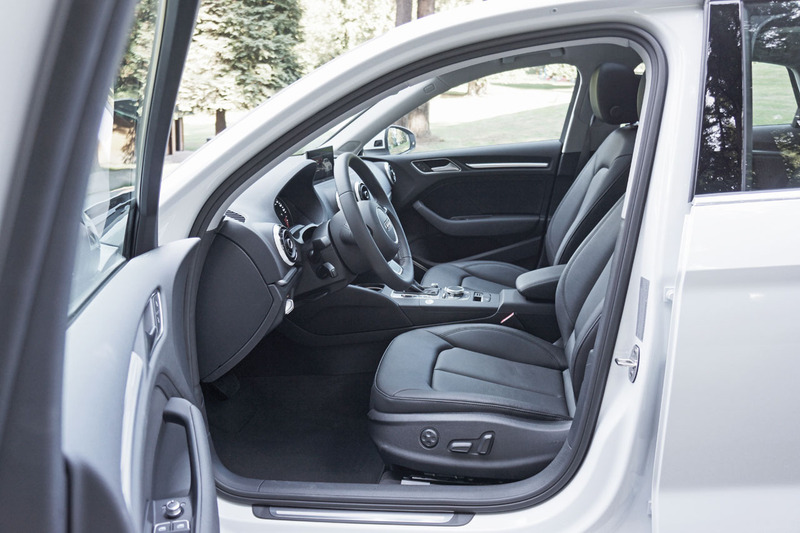 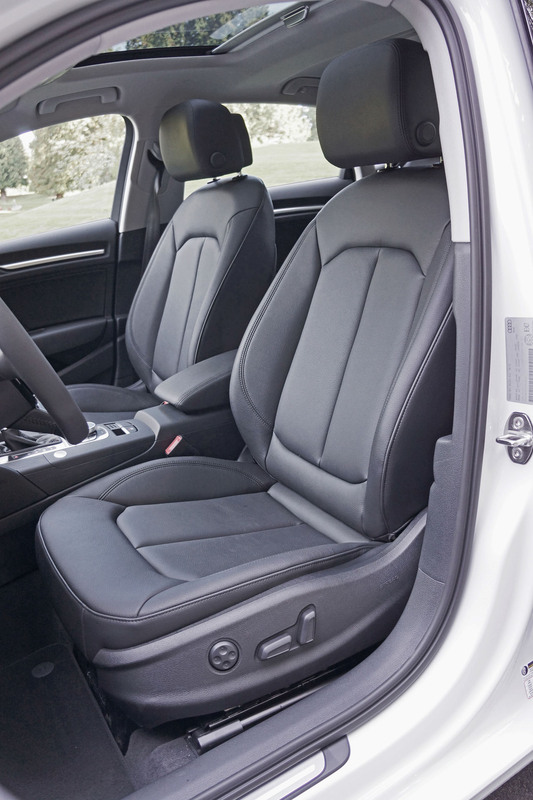 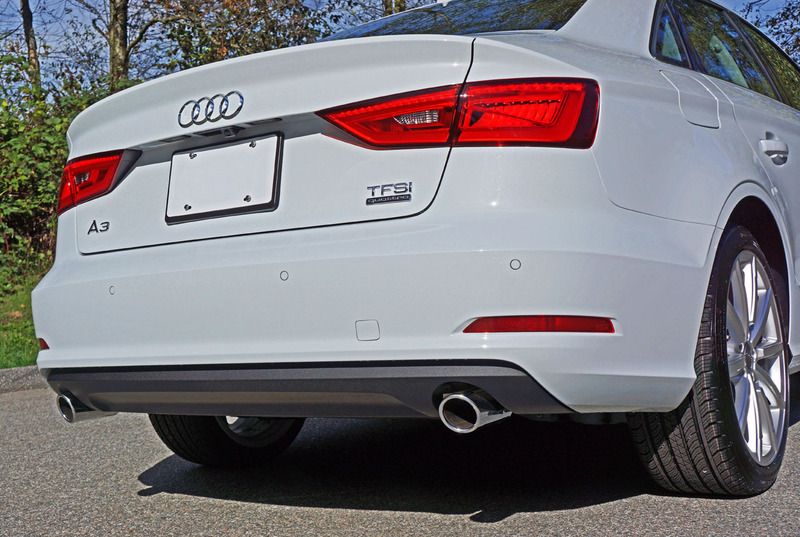 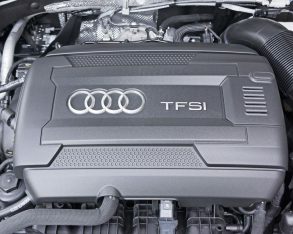 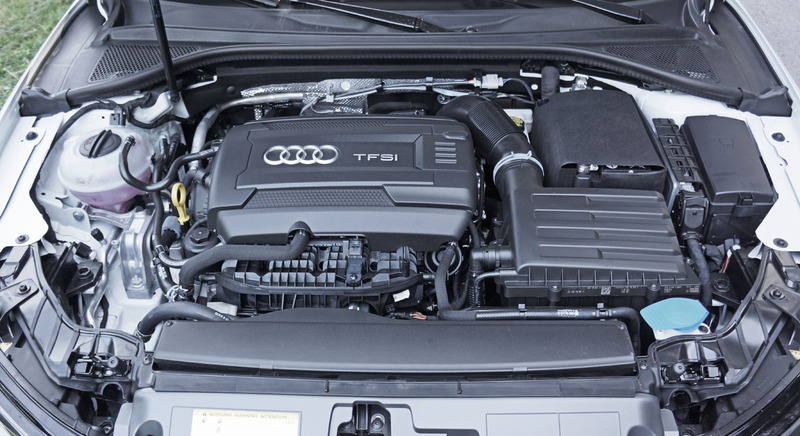 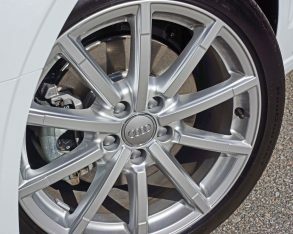 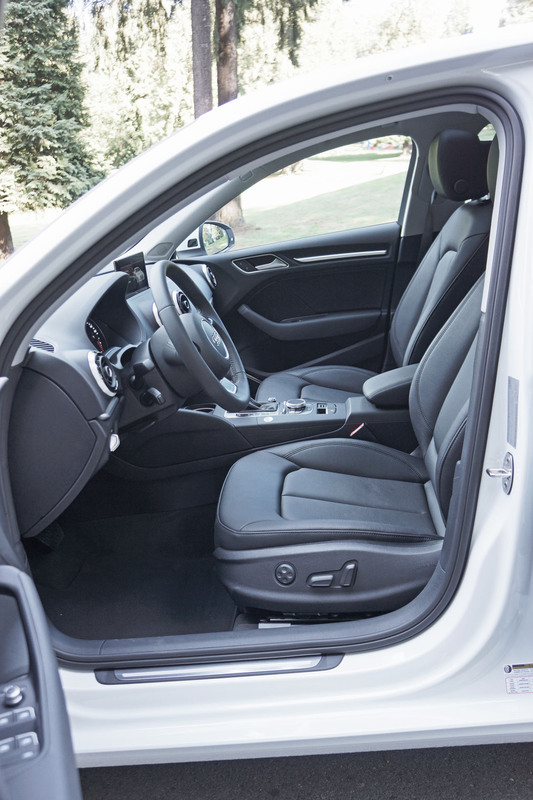 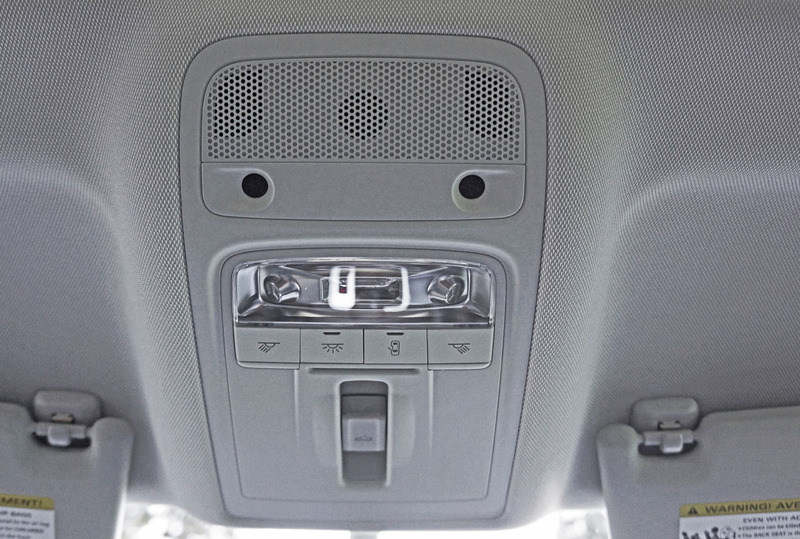 trim also requires the larger 2.0 TFSI engine that comes standard with Quattro. 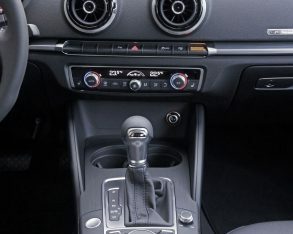 set includes the usual ABS-enhanced four-wheel discs with EBD and BA, plus traction and stability control, pre-sense basic crash response, plus the usual six airbags. 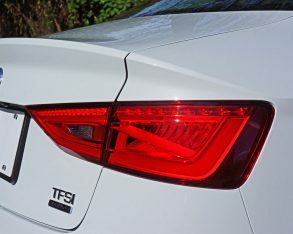 Mid-grade Progressiv trim increases the wheel and tire size to those 18s already noted, while adding the HID headlamps and LED daytime running lights that made my tester look so sharp, a set of LED taillights that deliver serious wow-factor at night, high-gloss window surrounds, aluminum doorsills, Mistral aluminum inlays inside, yet more aluminum trim, LED cabin lights, a powered front passenger seat, an auto-dimming rearview mirror, Audi’s music interface, and more. 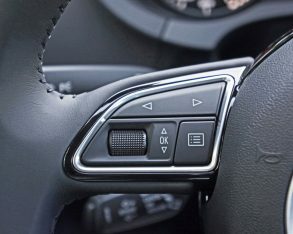 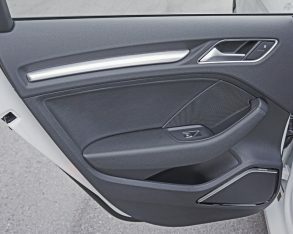 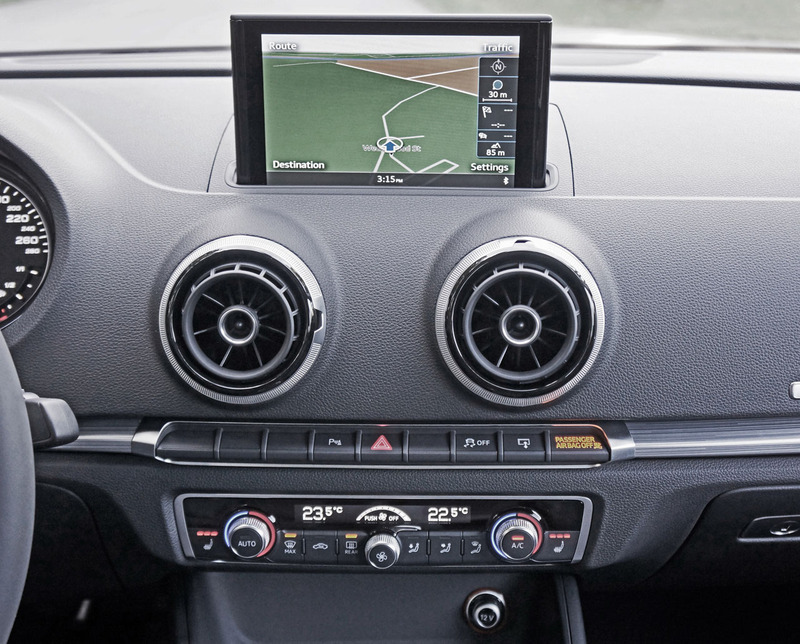 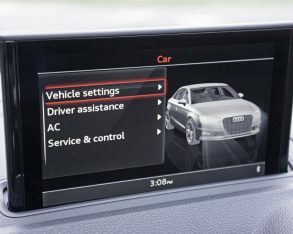 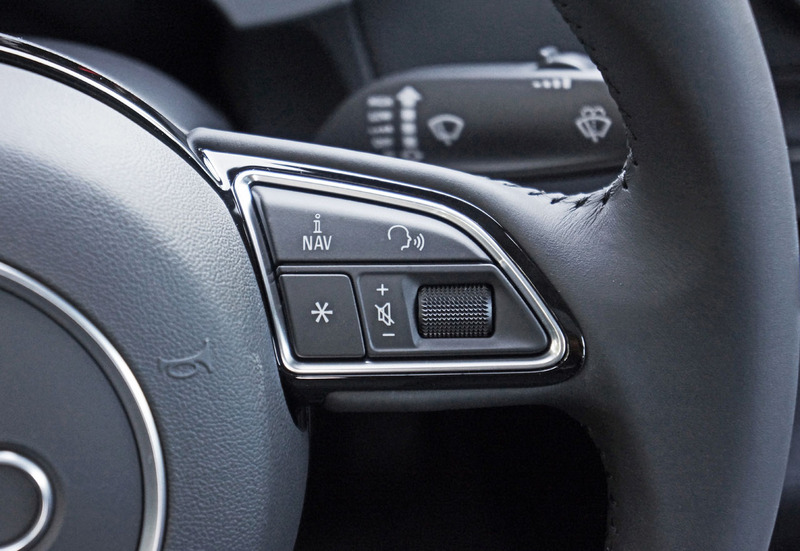 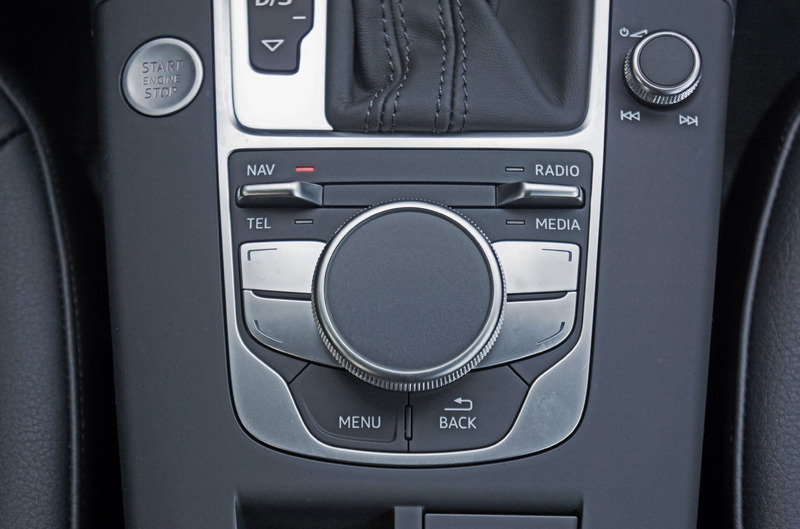 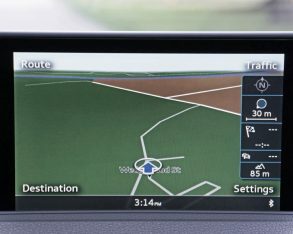 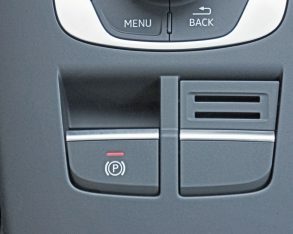 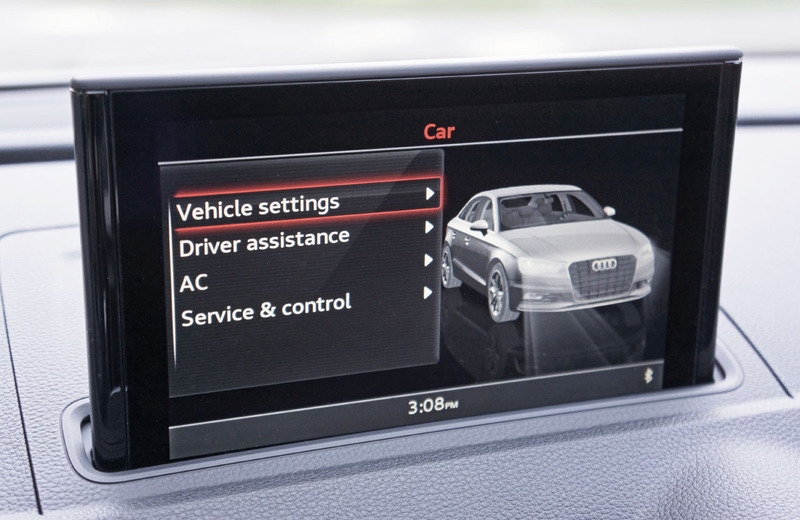 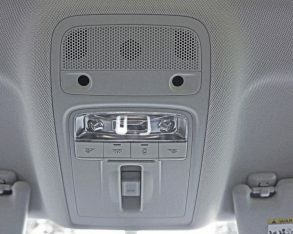 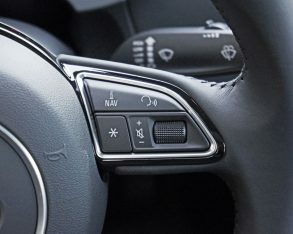 keyless remote, both a reverse camera and navigation were added to the infotainment system, not to mention a crystal clear Bang & Olufsen audio upgrade, plus a colour multi-information display amid the primary gauges, Audi side assist to warn from approaching rear traffic that might be in your blind spot, plus front and rear parking sonar, altogether totaling a still reasonable $43,300. 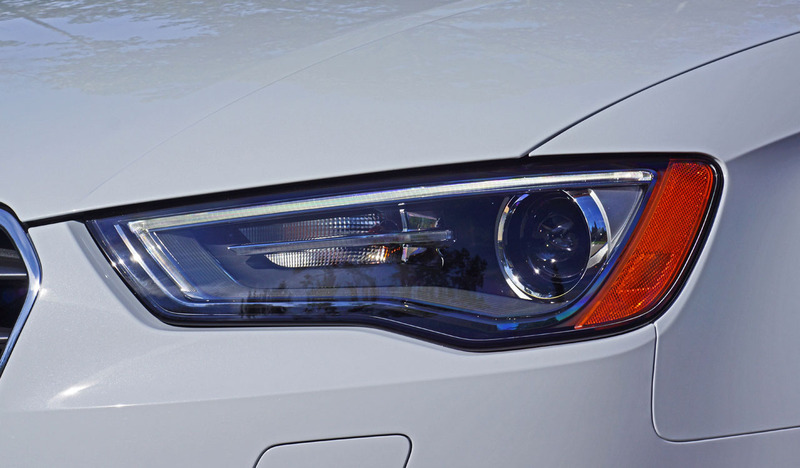 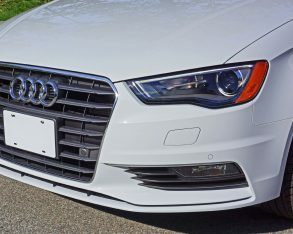 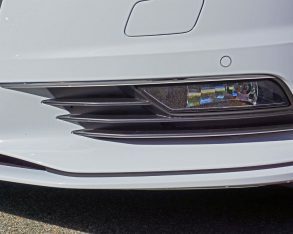 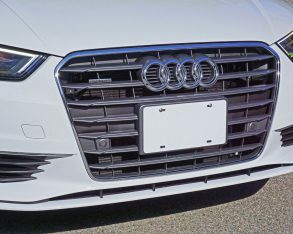 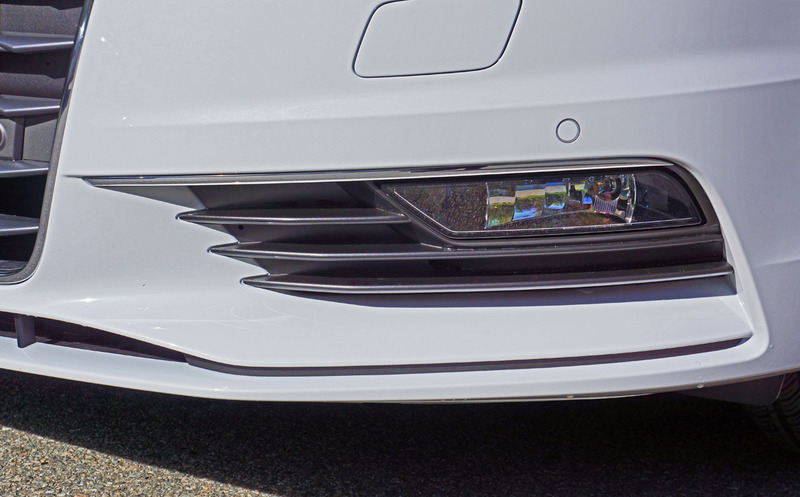 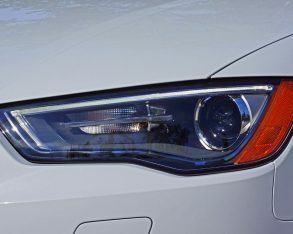 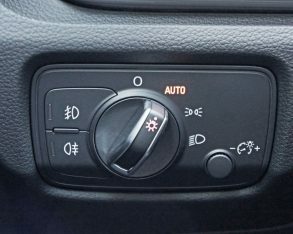 that adds (you guessed it) full LED headlamps with (you probably didn’t guess it) adaptive cornering; and lastly a $1,400 Technology Package that includes adaptive cruise control with “Stop & Go”, active lane assist, and Audi’s pre sense front accident avoidance system. 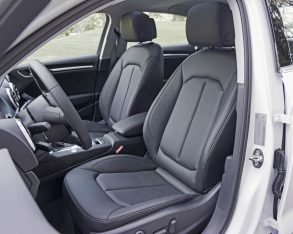 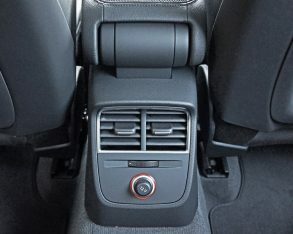 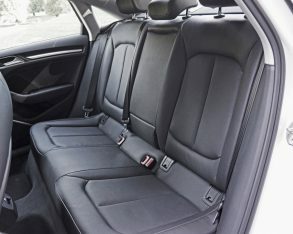 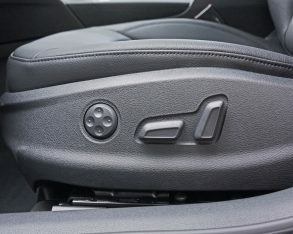 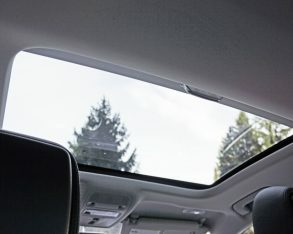 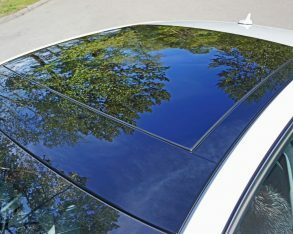 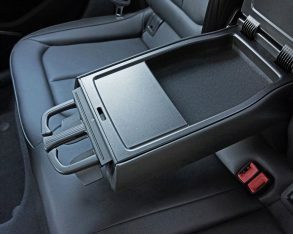 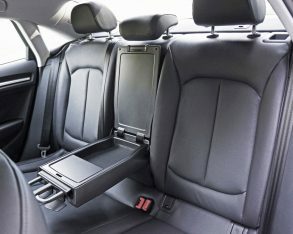 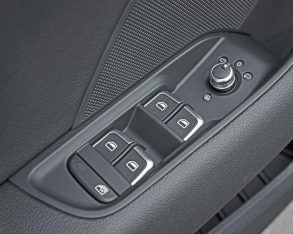 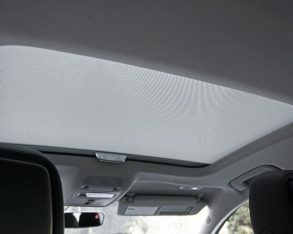 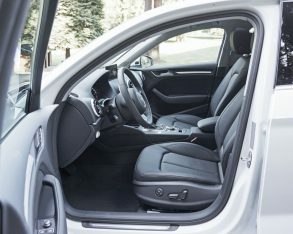 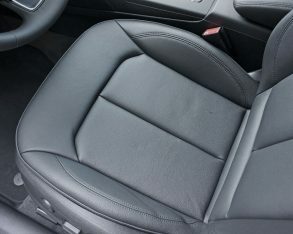 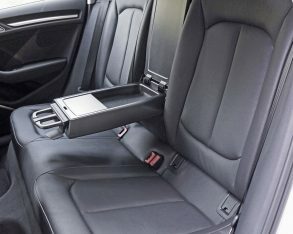 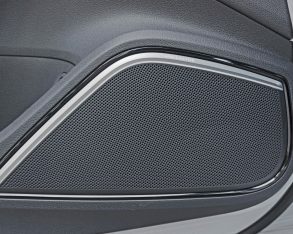 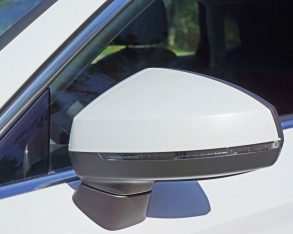 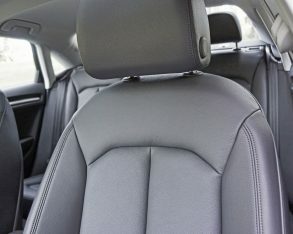 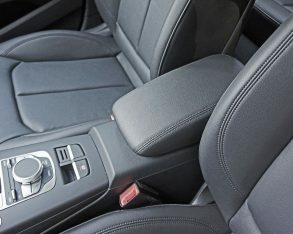 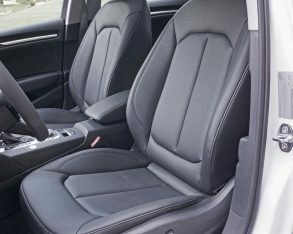 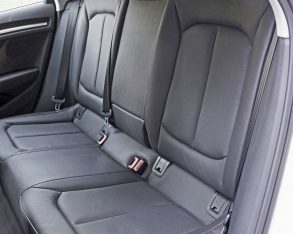 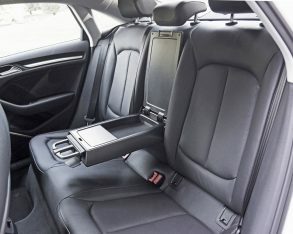 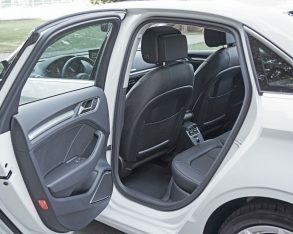 Standalone features in Technik trim include a set of $450 rear side airbags, $800 worth of 19-inch twin-spoke alloys (which first require the S line package), and three no-cost exterior colours plus seven metallic hues for $800, while the interior can be finished in standard Black, Chestnut Brown or Titanium Grey, all at no extra charge. 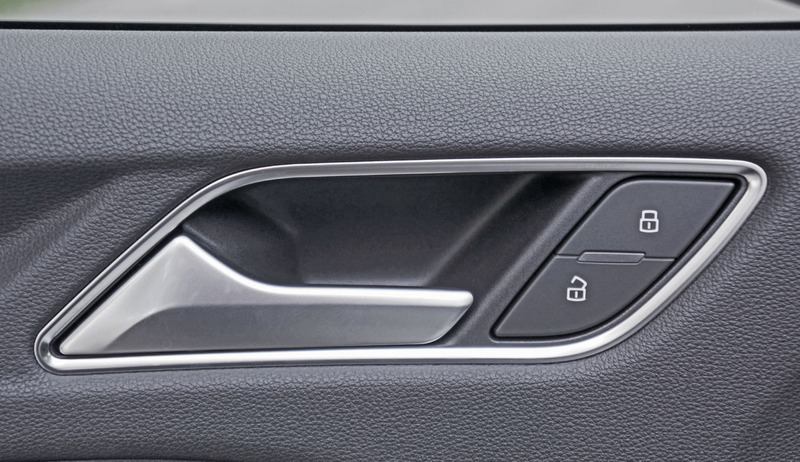 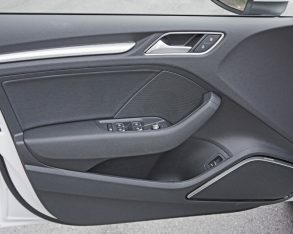 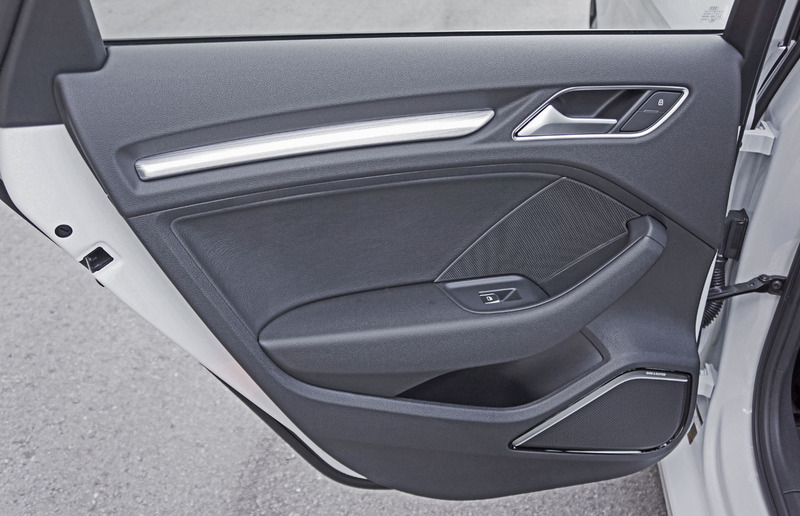 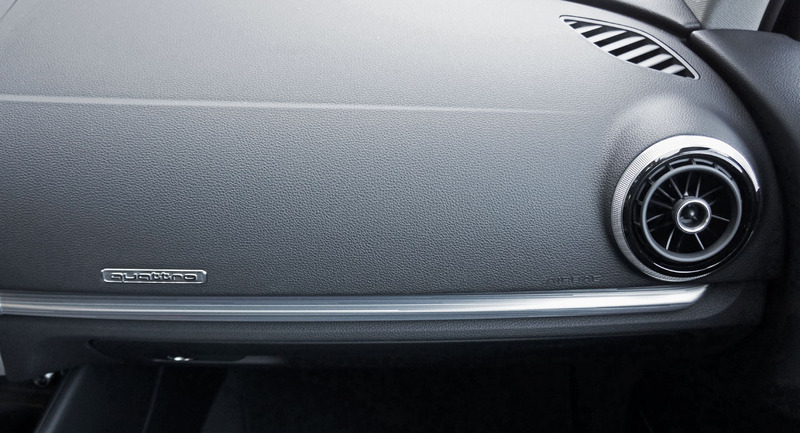 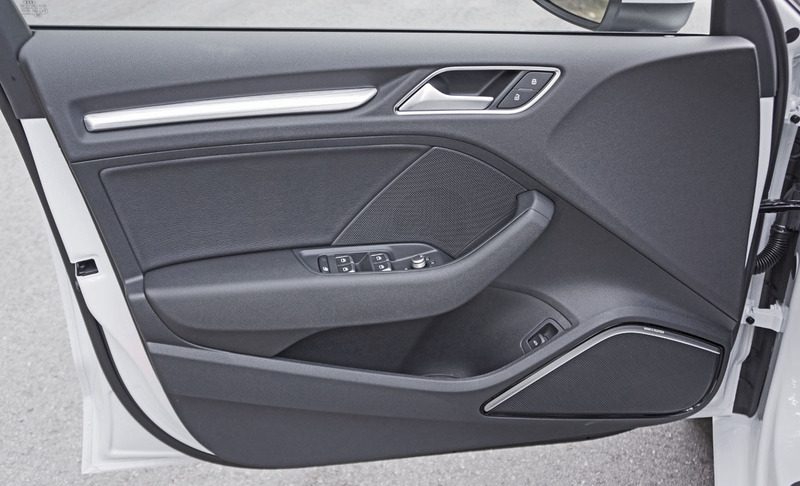 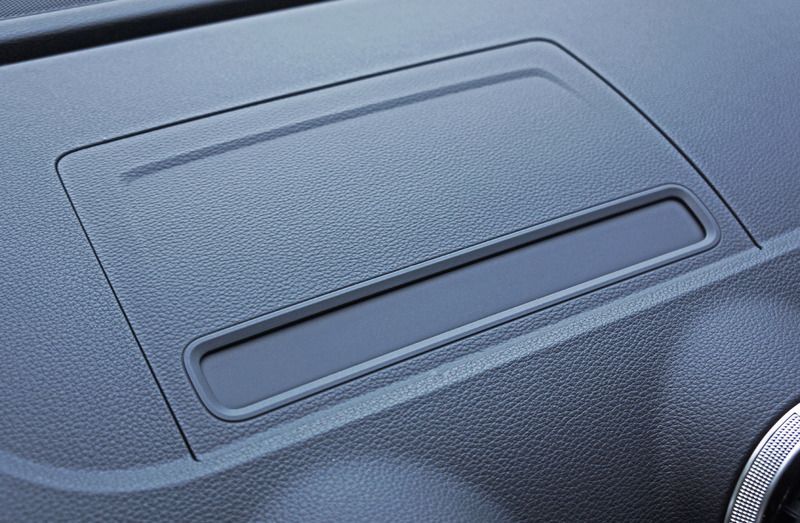 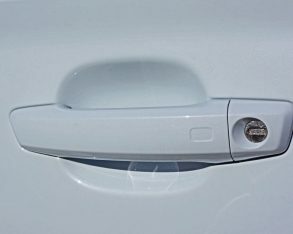 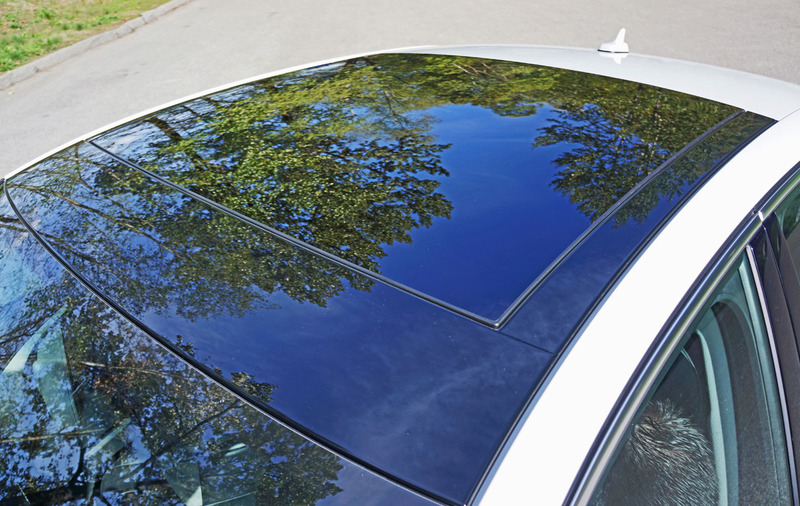 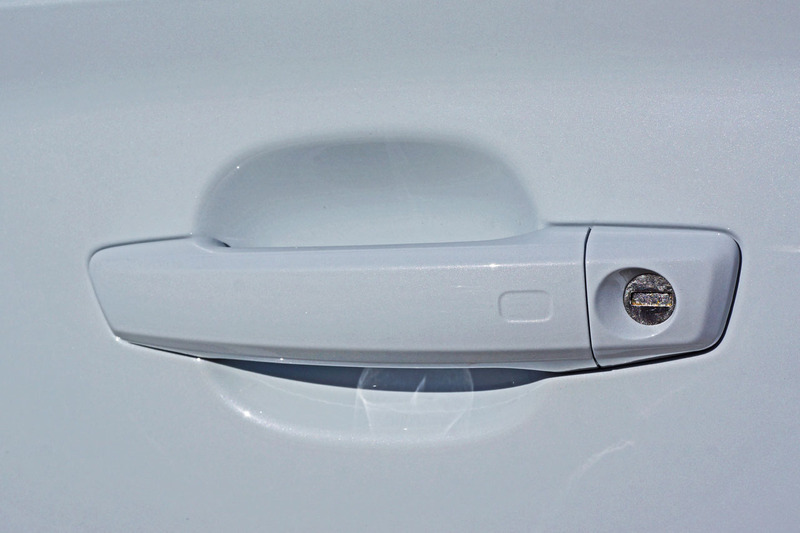 Lastly, you can get your interior inlays finished in a 3D-look silver, also at no cost. 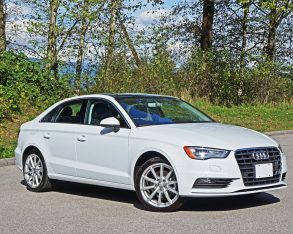 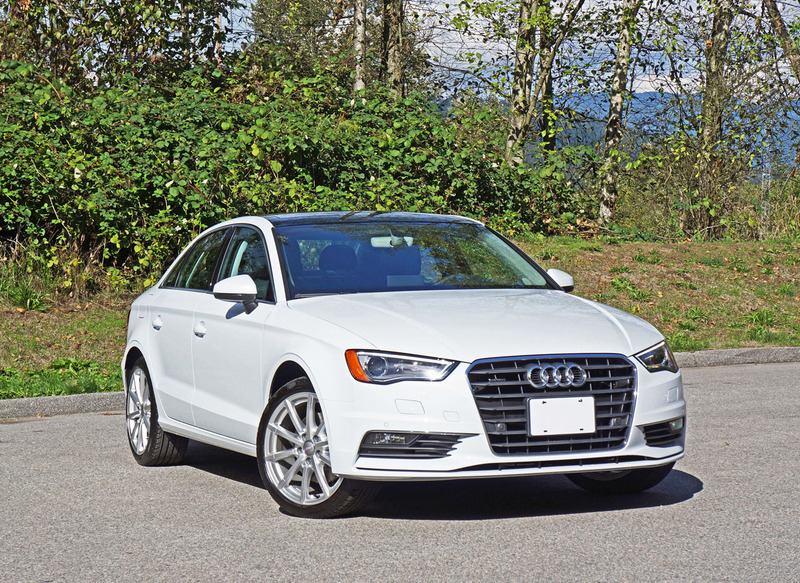 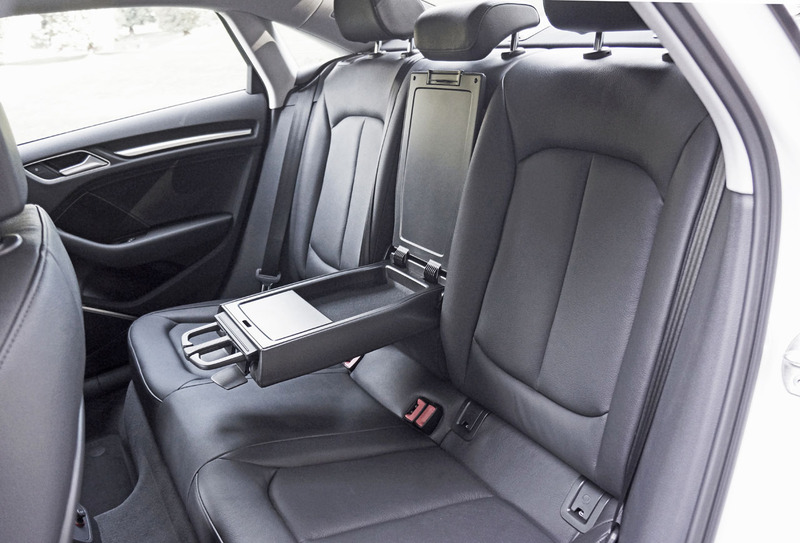 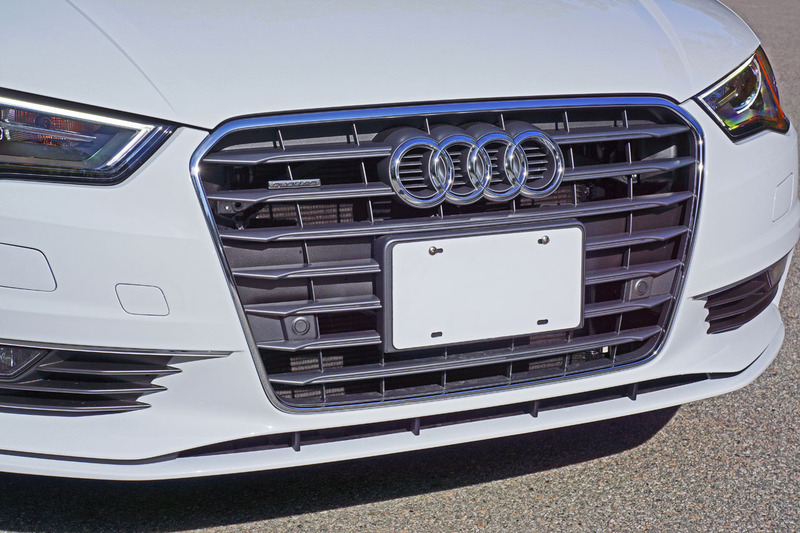 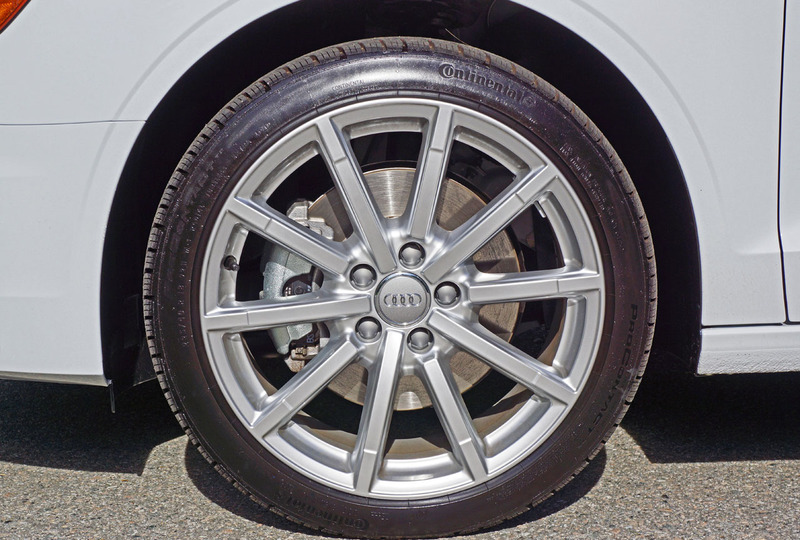 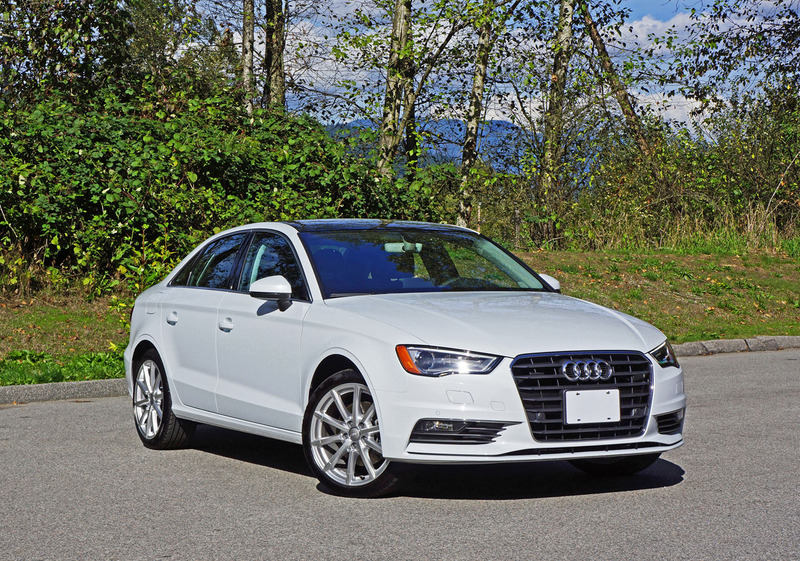 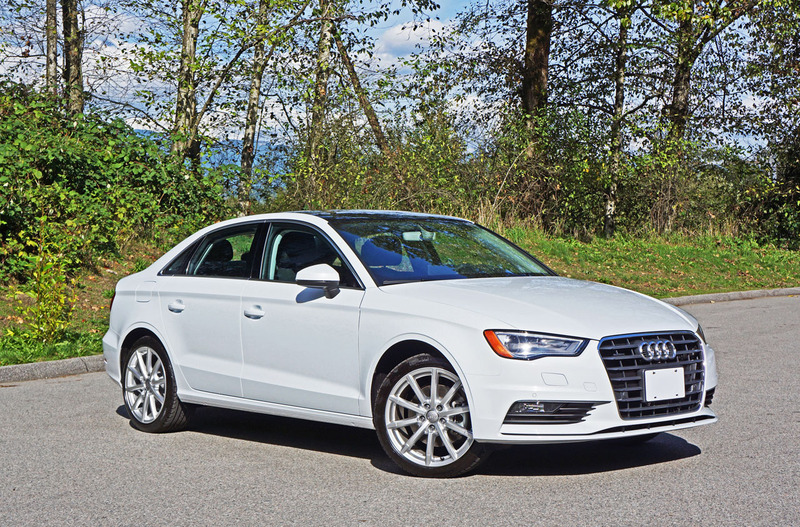 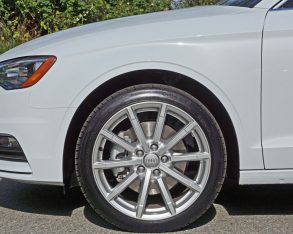 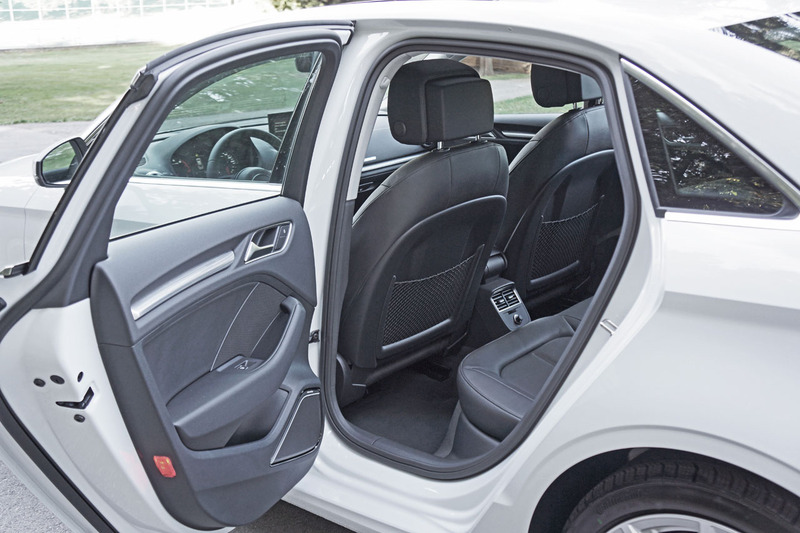 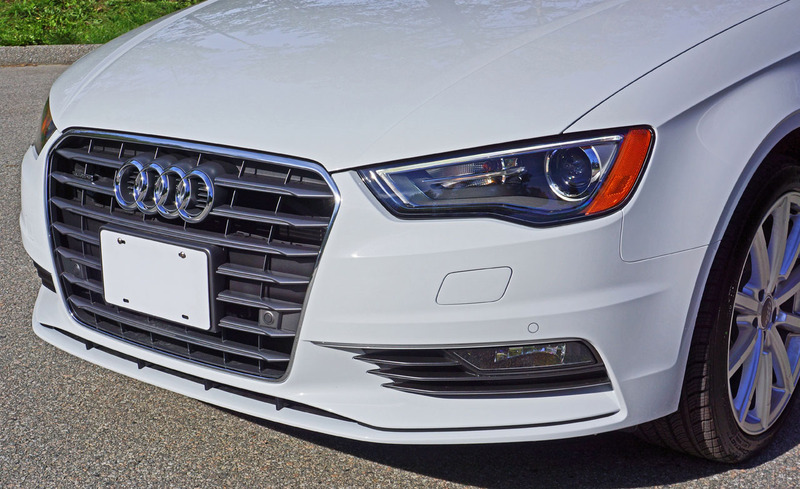 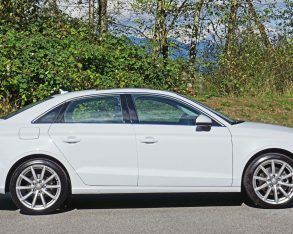 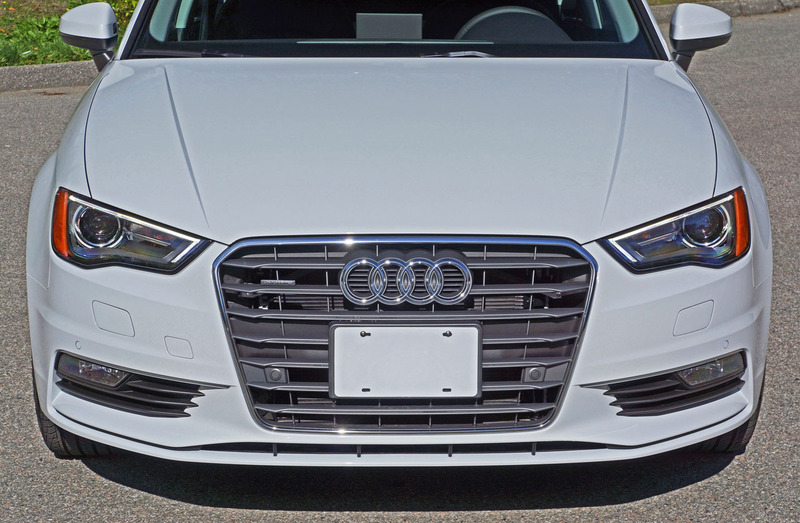 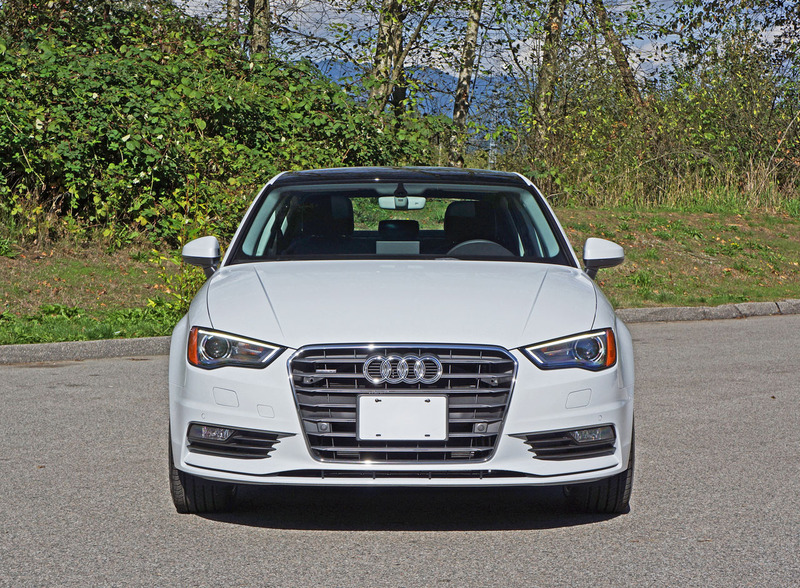 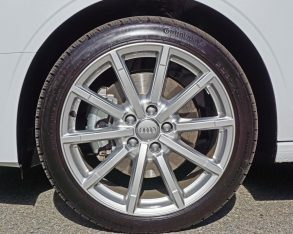 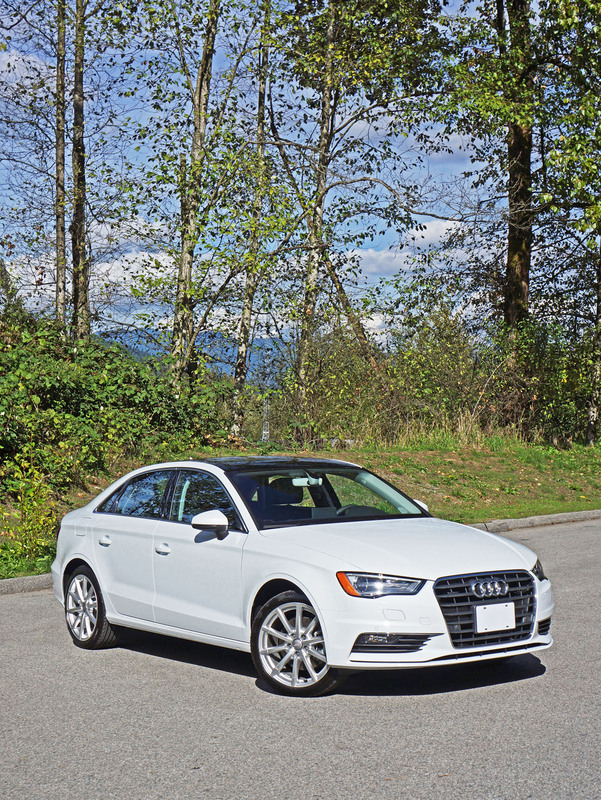 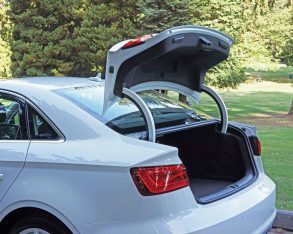 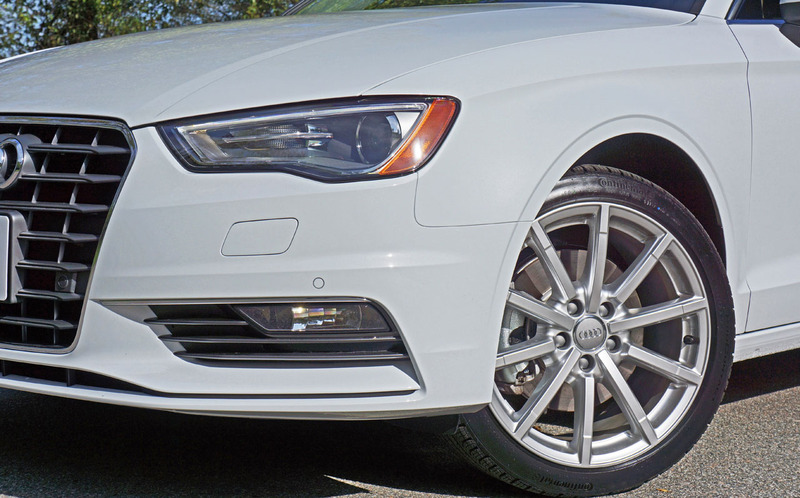 you can likely now appreciate, you don’t have to move up in size to feel thoroughly pampered in an Audi, the little A3 Sedan exactly what the premium compact segment needed and thoroughly capable of making the rest of the four-ringed family proud. 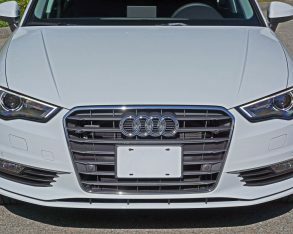 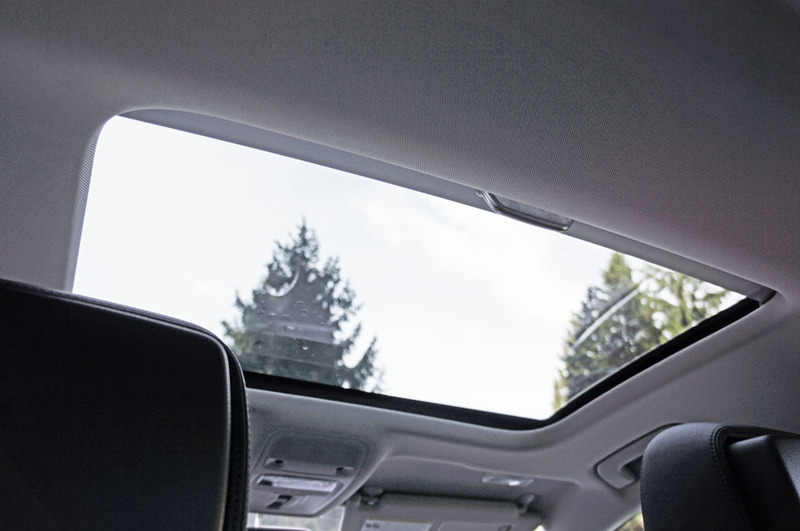 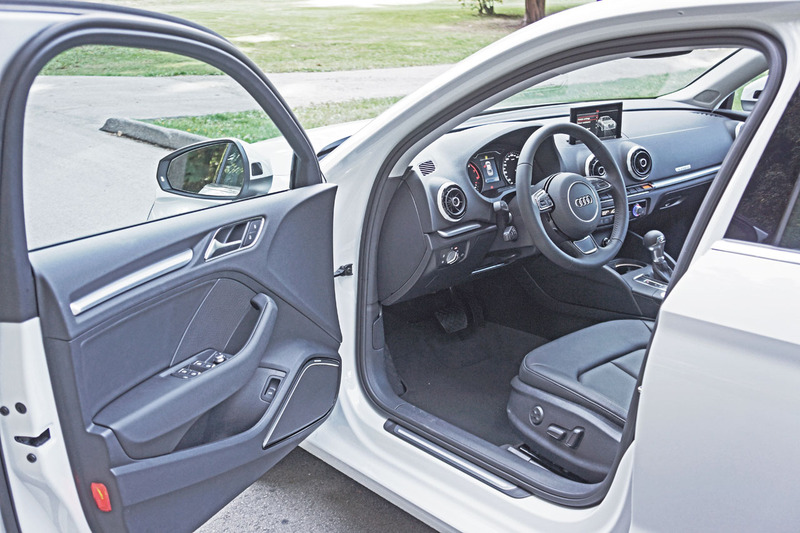 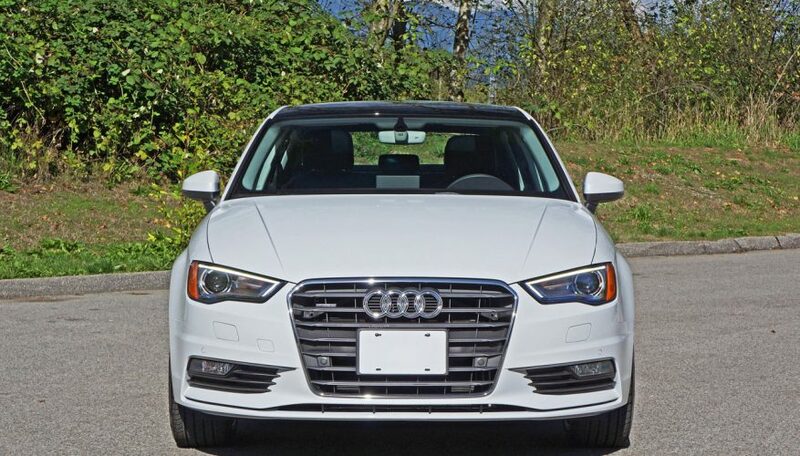 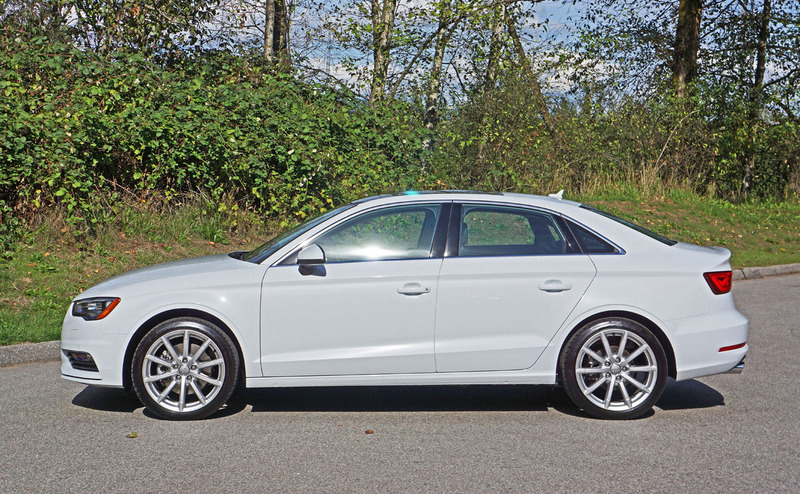 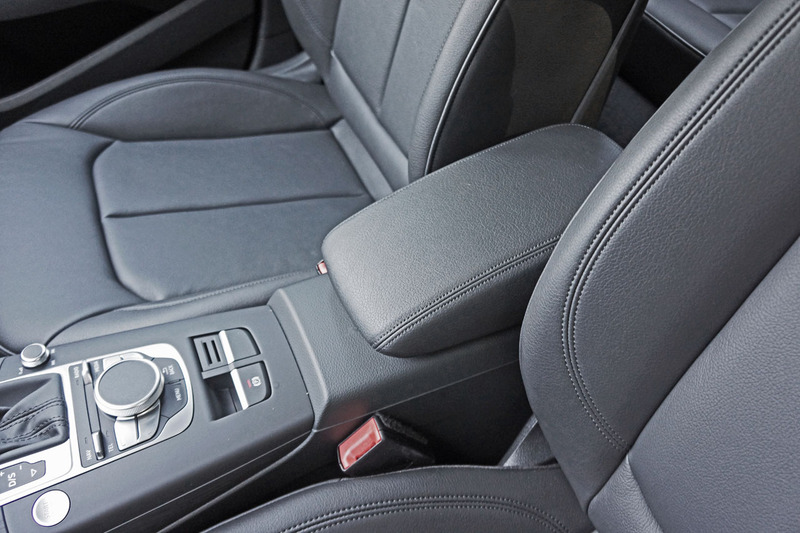 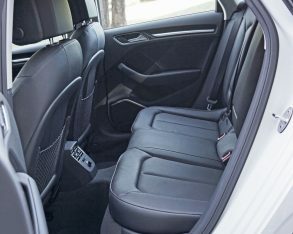 It’s got the looks, interior refinement, features, and performance to wear Audi’s badge with pride, and should be the first car you check out in your search for a compact luxury model.